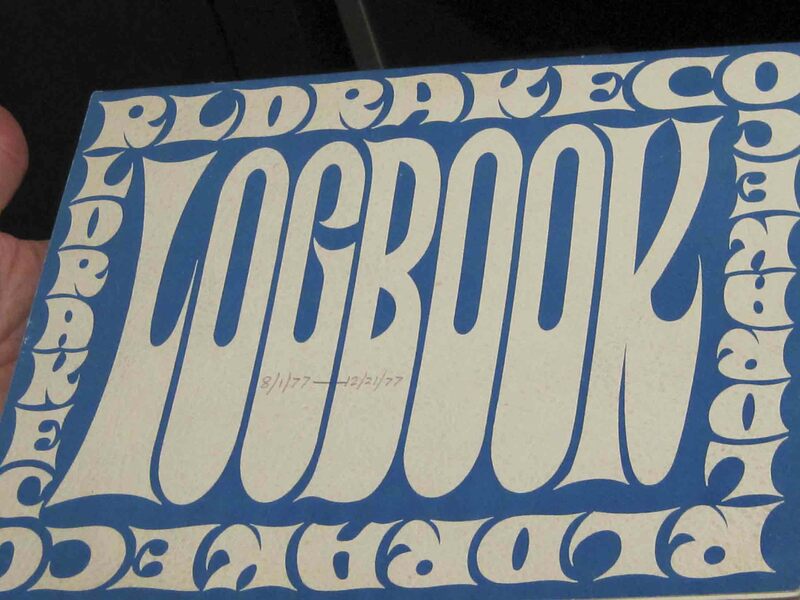 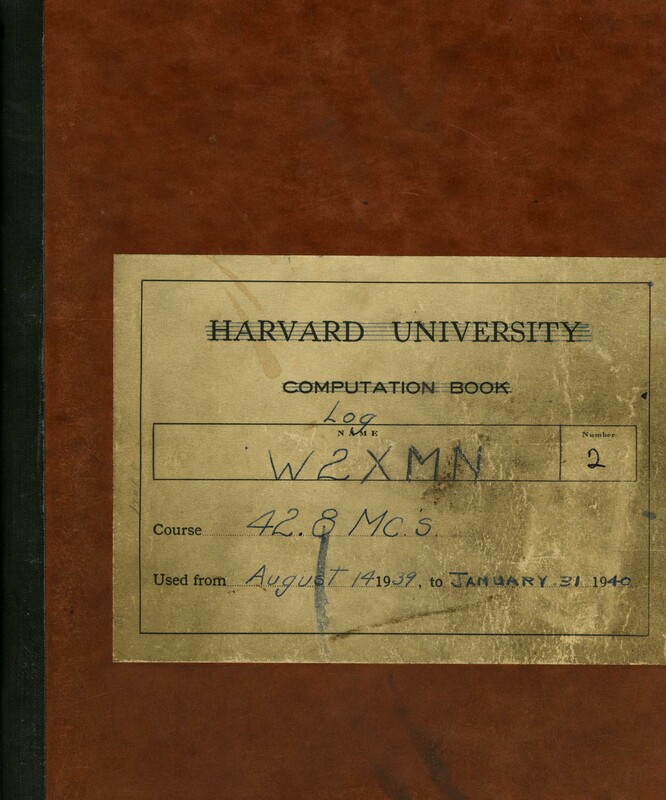 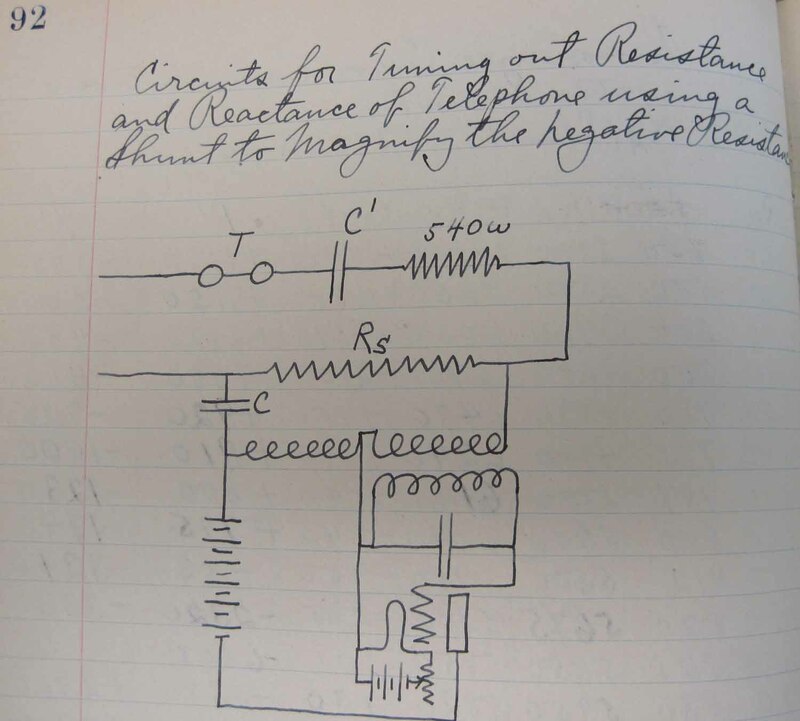 As can be imagined, there are quite a number of patents to be found within this collection. 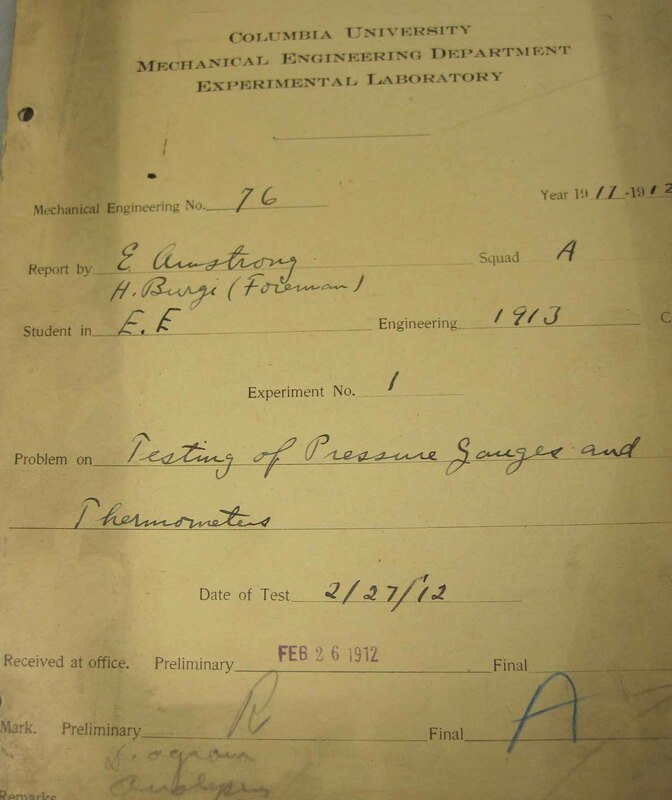 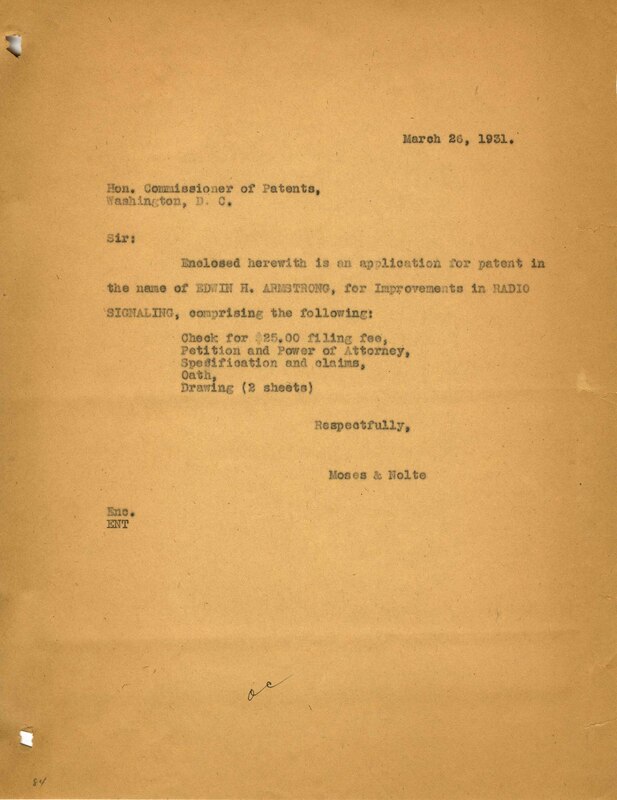 In addition to Armstrong’s patents, a variety of patents issued to other individuals can be found as well. 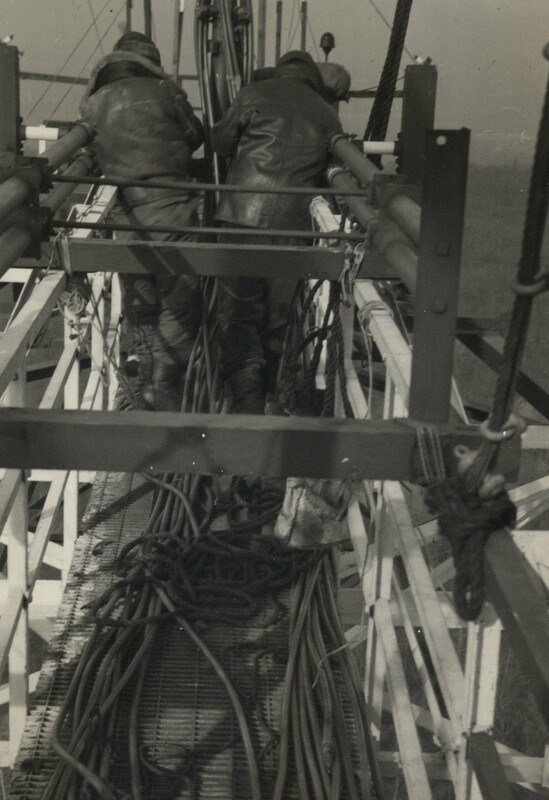 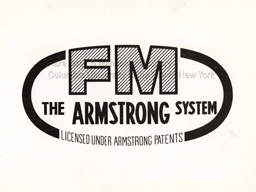 Armstrong was issued five patents on December 26, 1933. 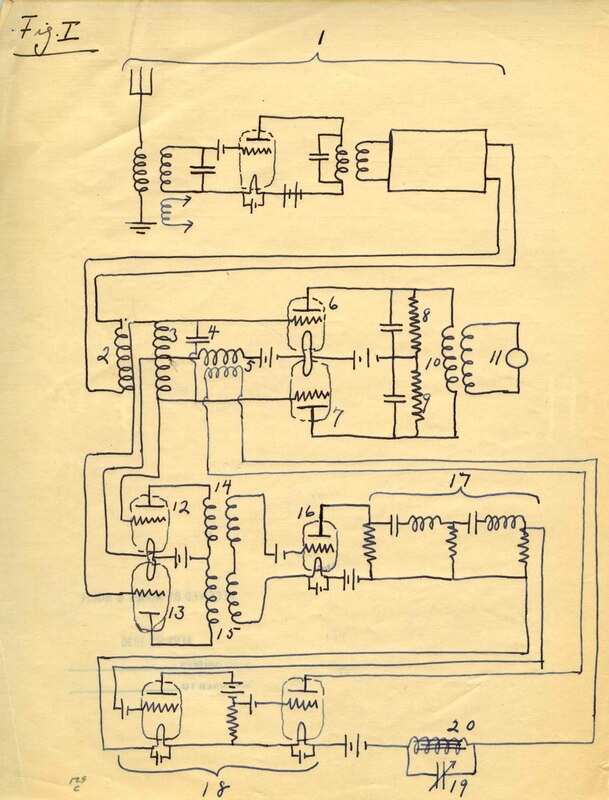 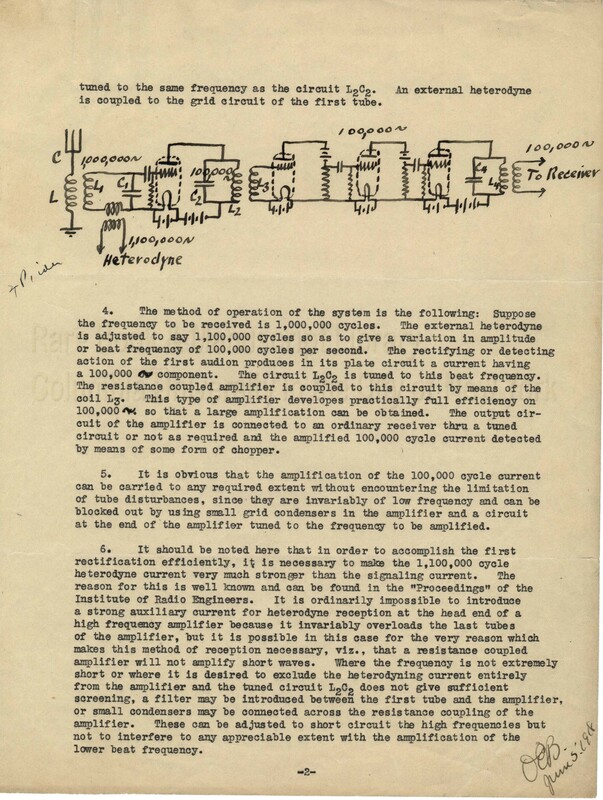 The first is patent number 1,941,066 titled: "Radio Signaling System," the second is patent 1,941,067:"Radio Broadcasting and Receiving," the third is patent 1,941,068: "Radiosignaling," the fourth is patent 1,941,069: "Radiosignaling" (specifically dealing with noise suppression), and the last is patent 1,941,447: "Radio Telephone Signaling." 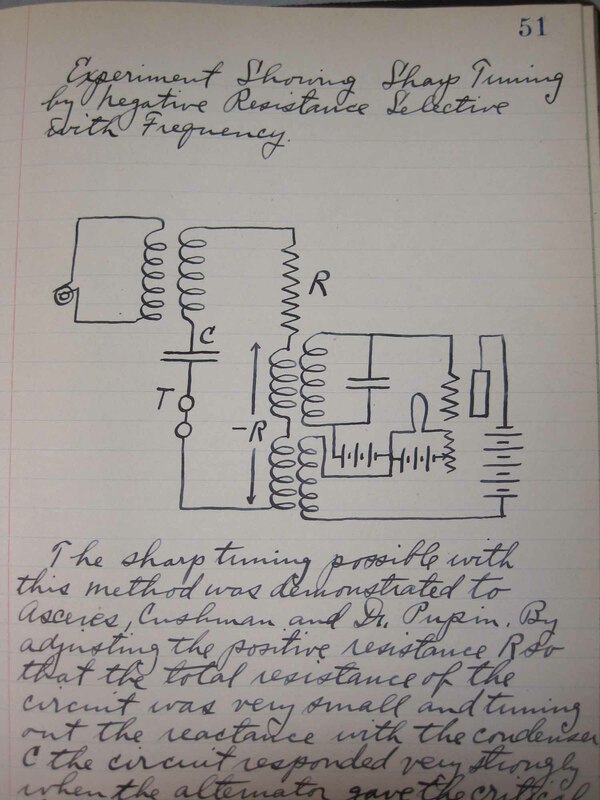 I came upon a patent application that appears to have been "dropped". 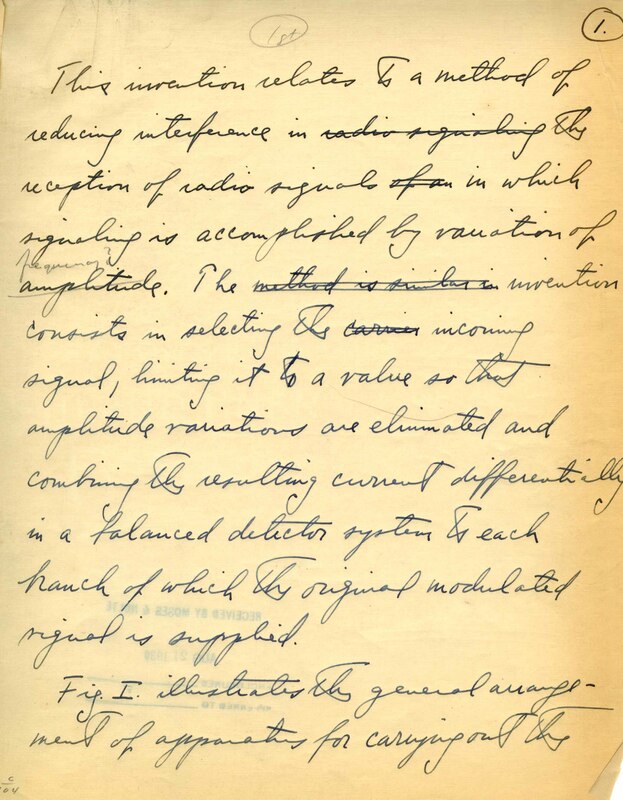 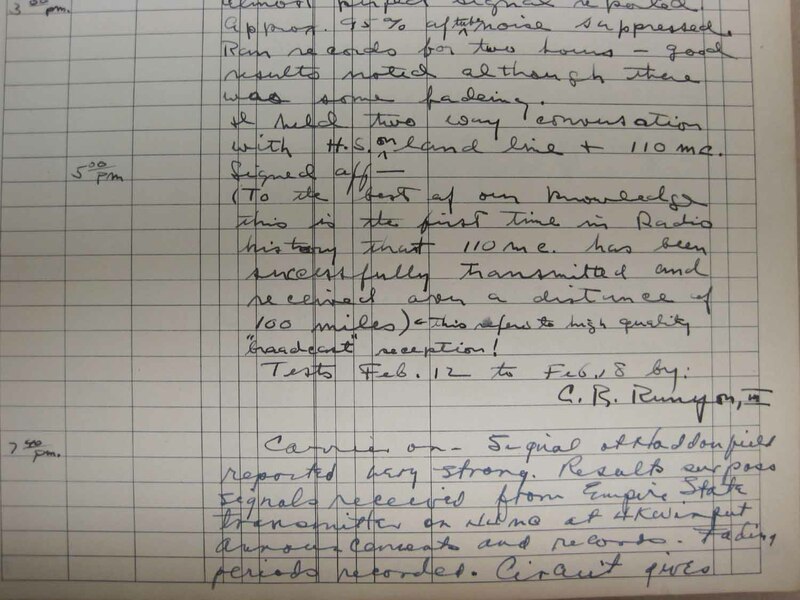 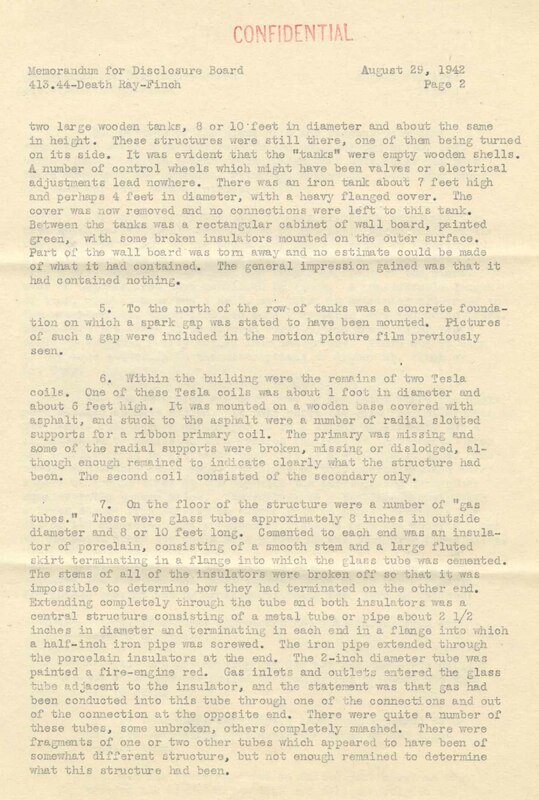 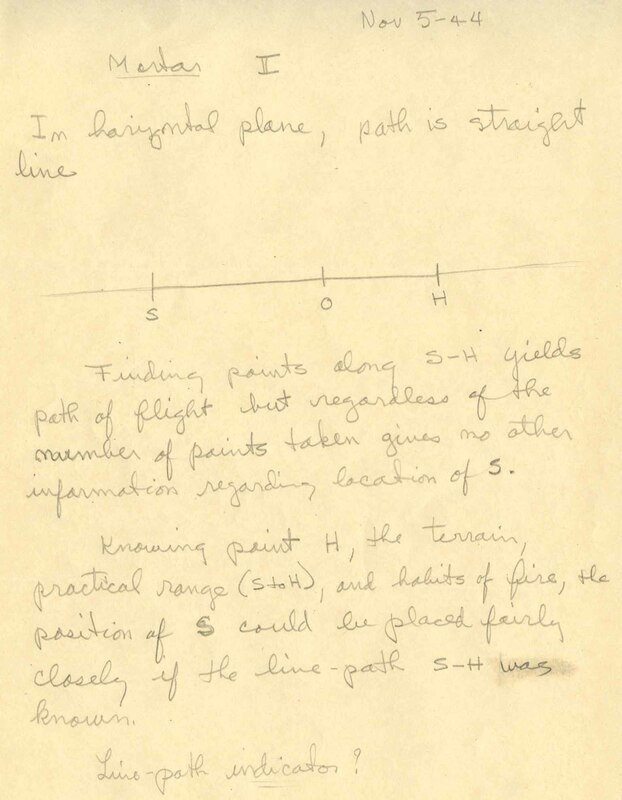 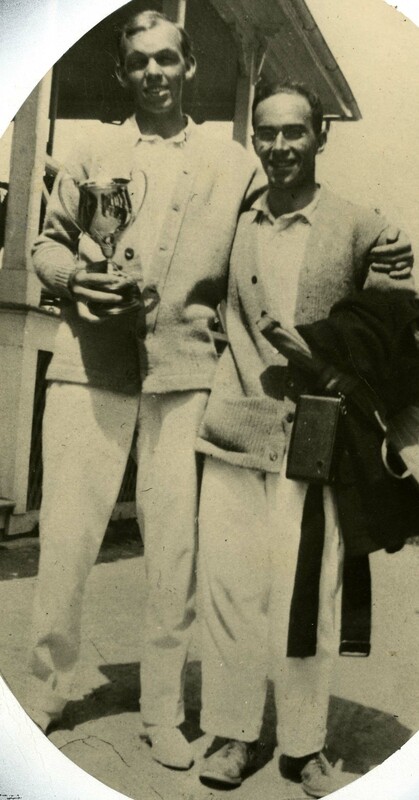 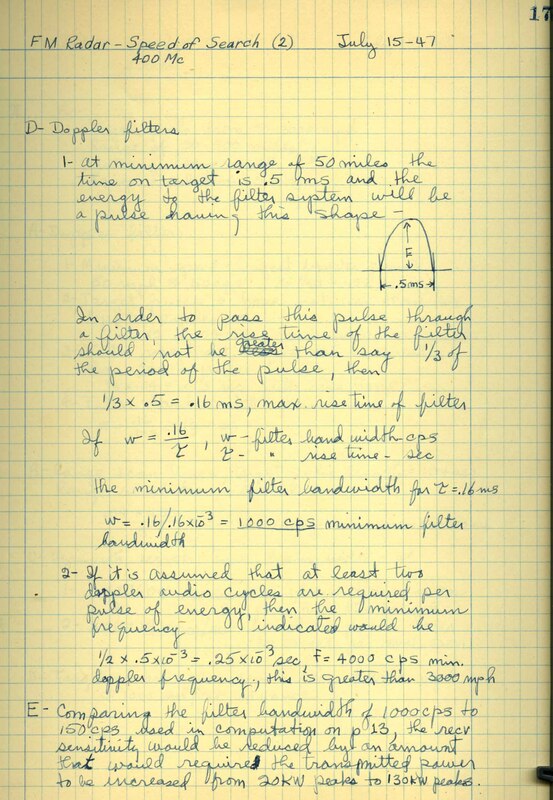 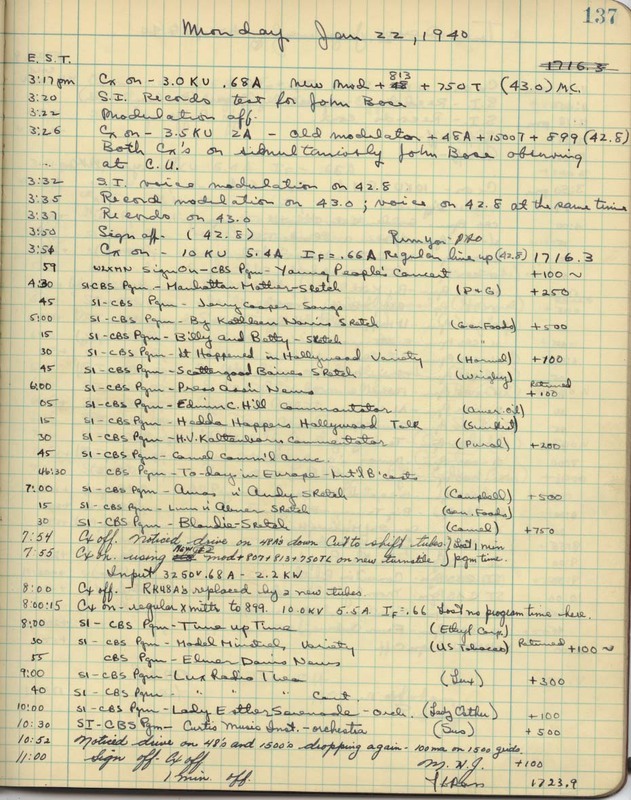 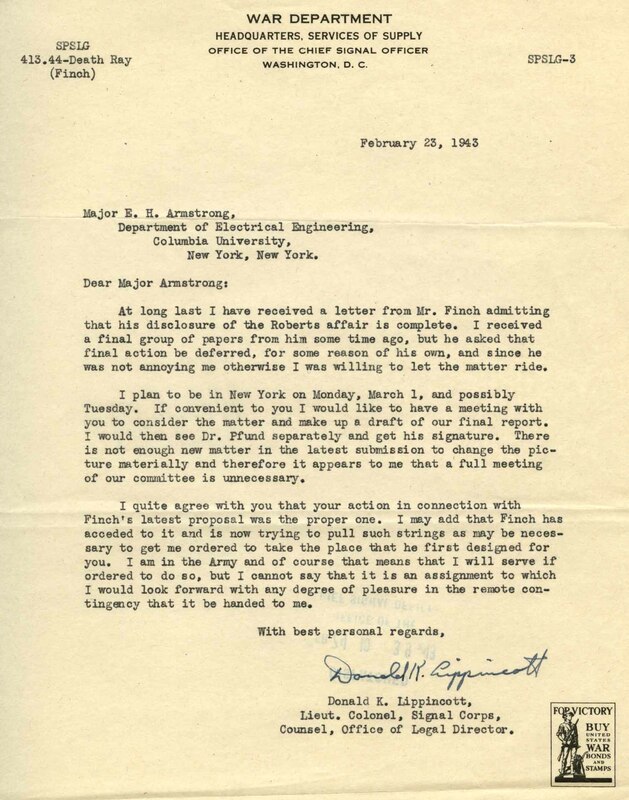 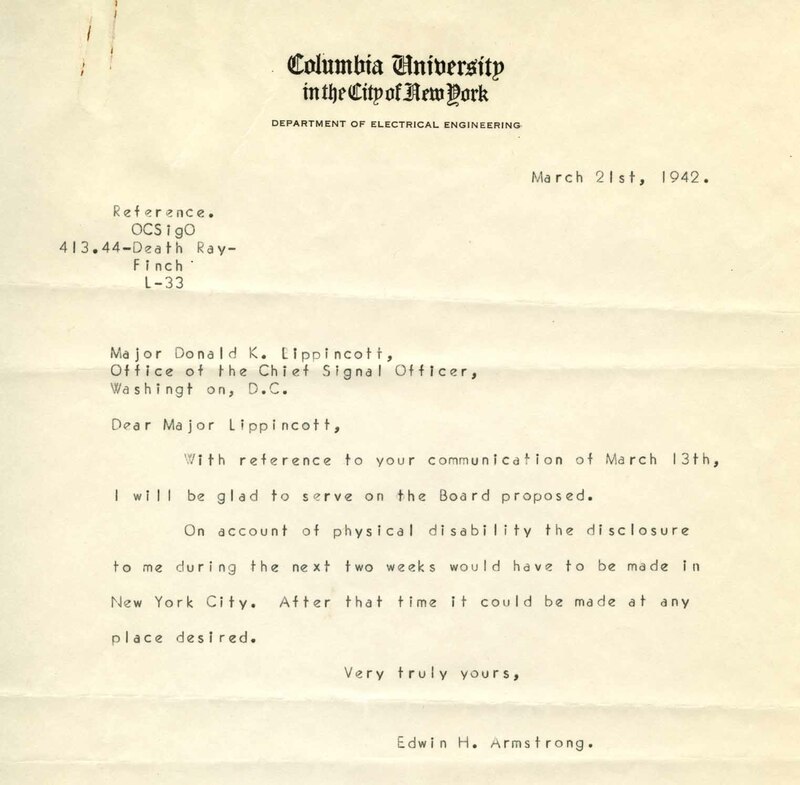 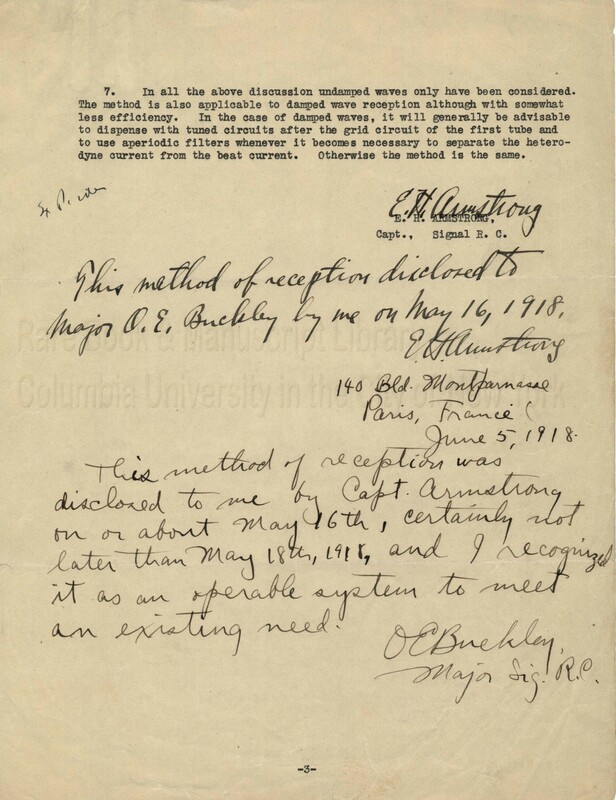 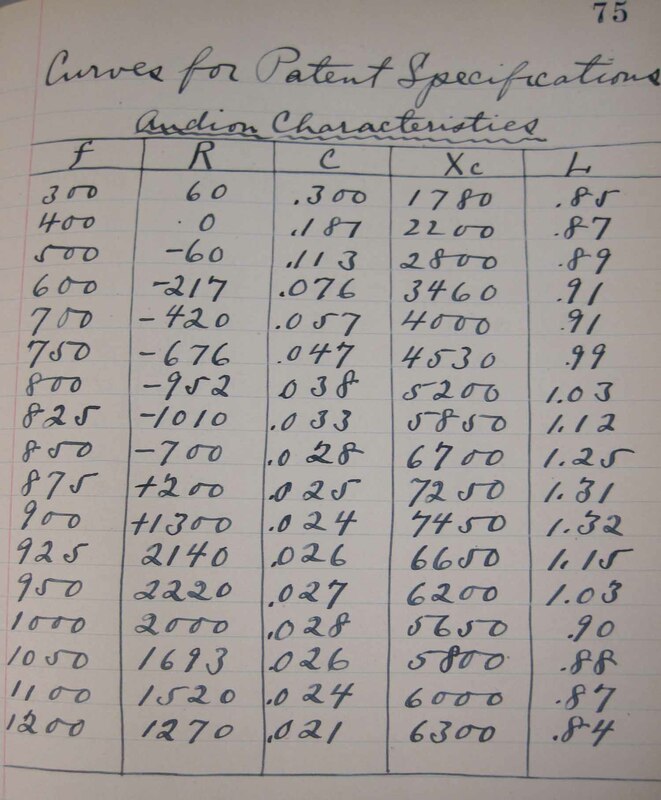 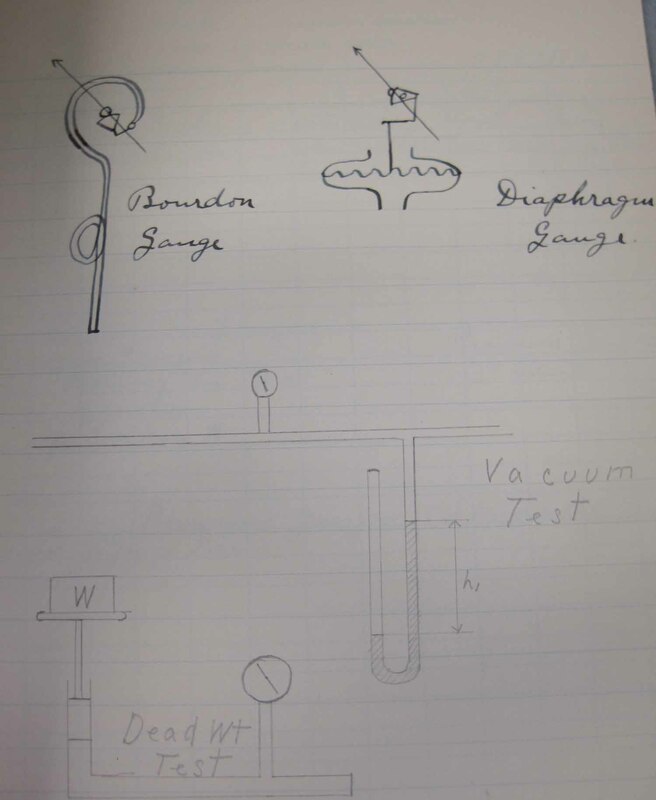 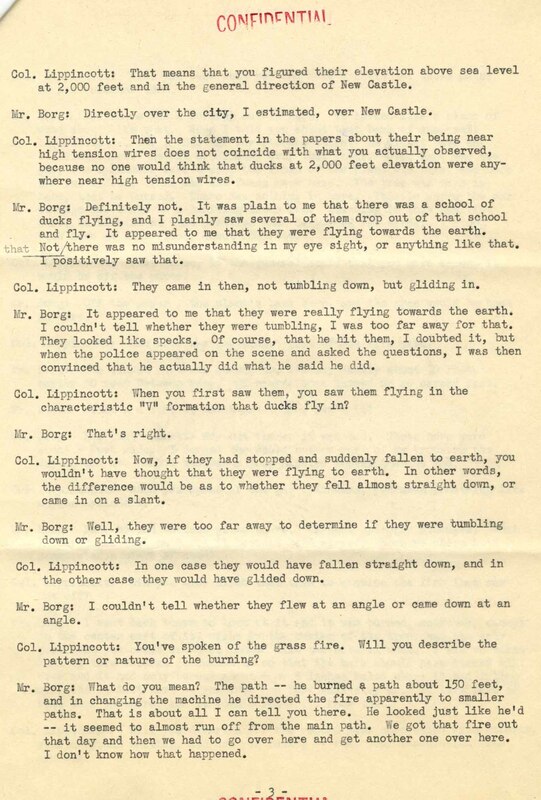 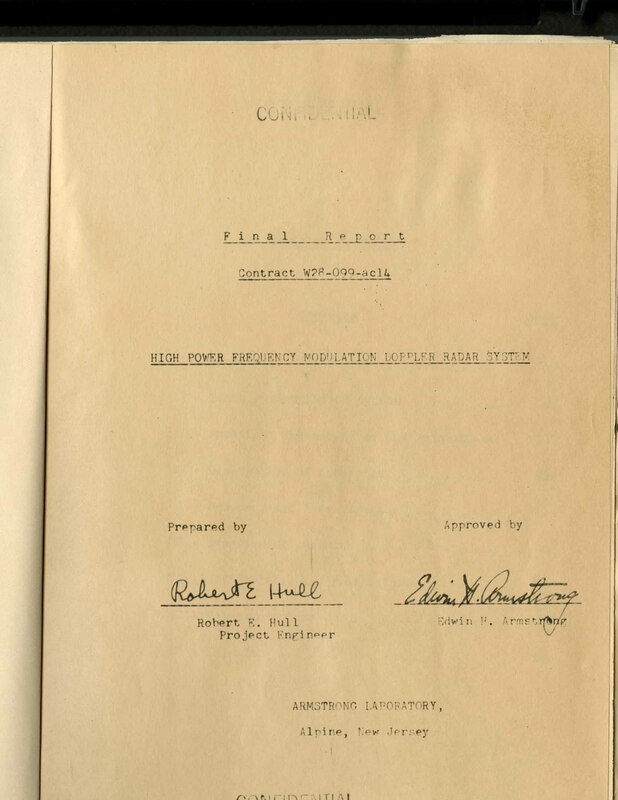 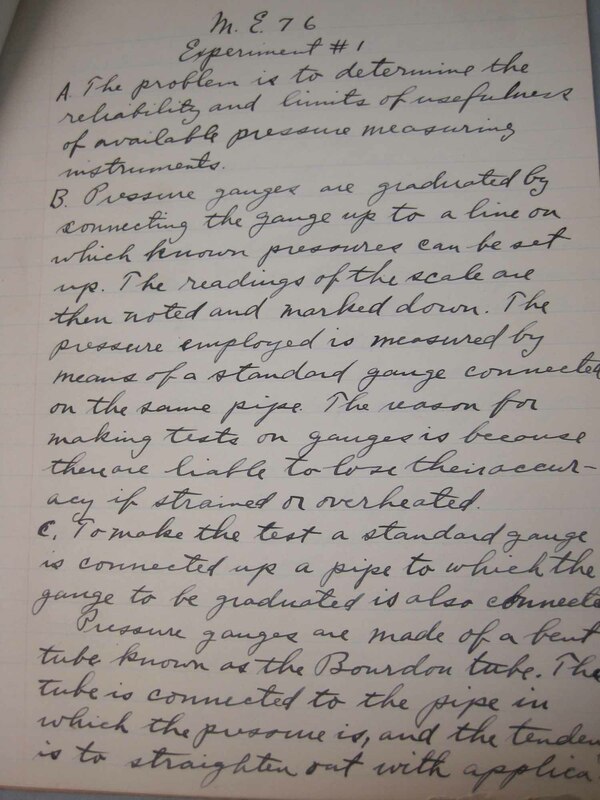 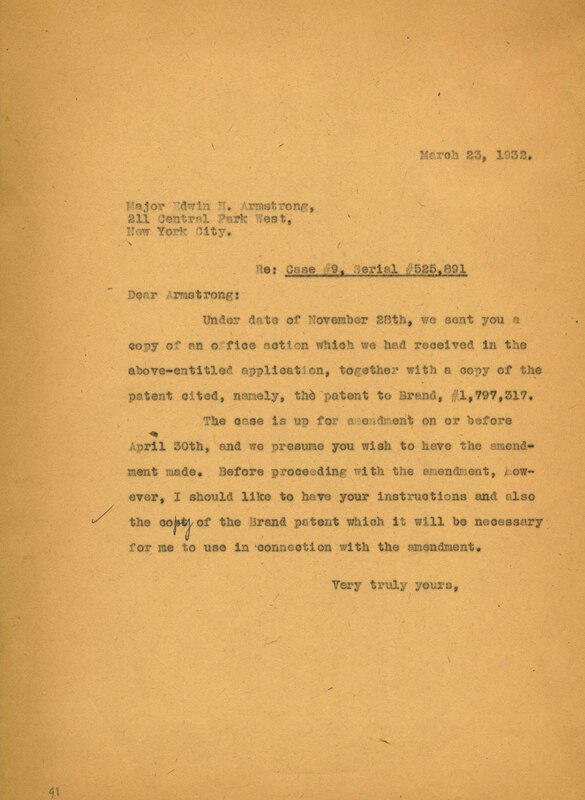 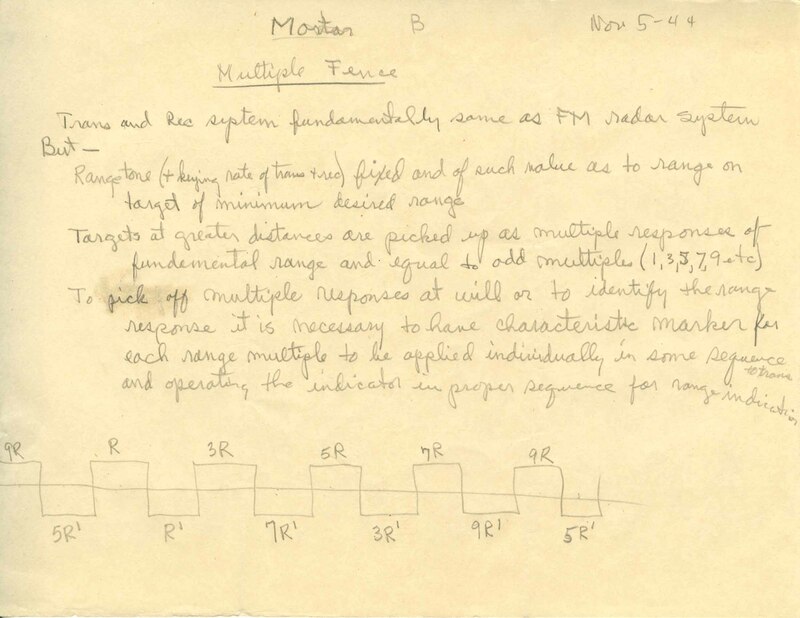 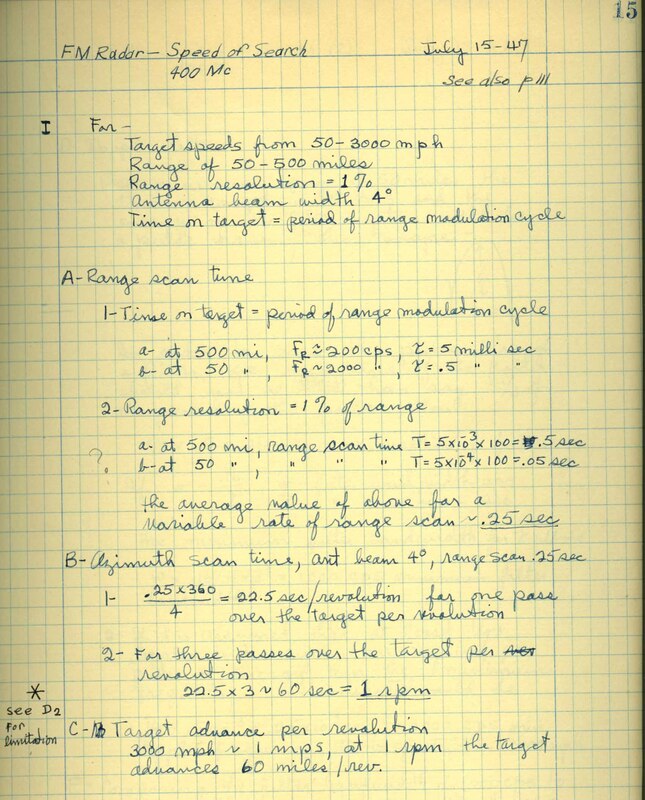 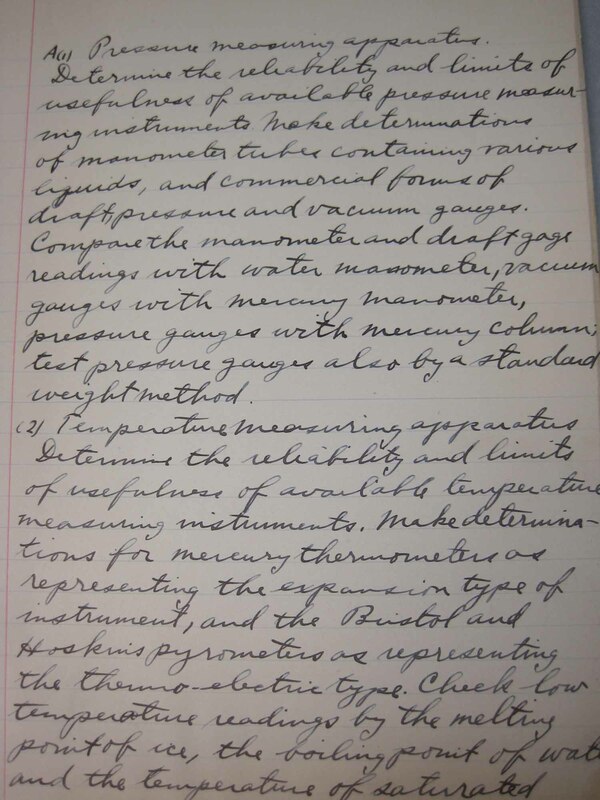 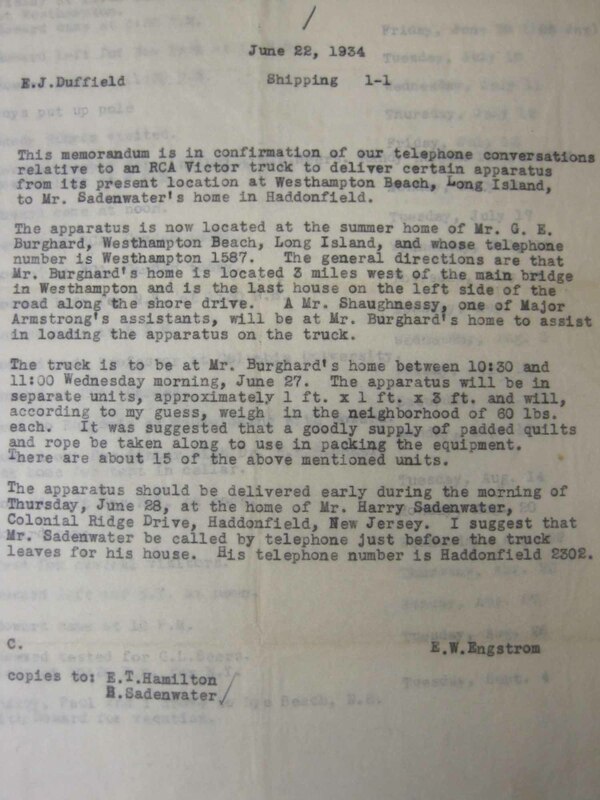 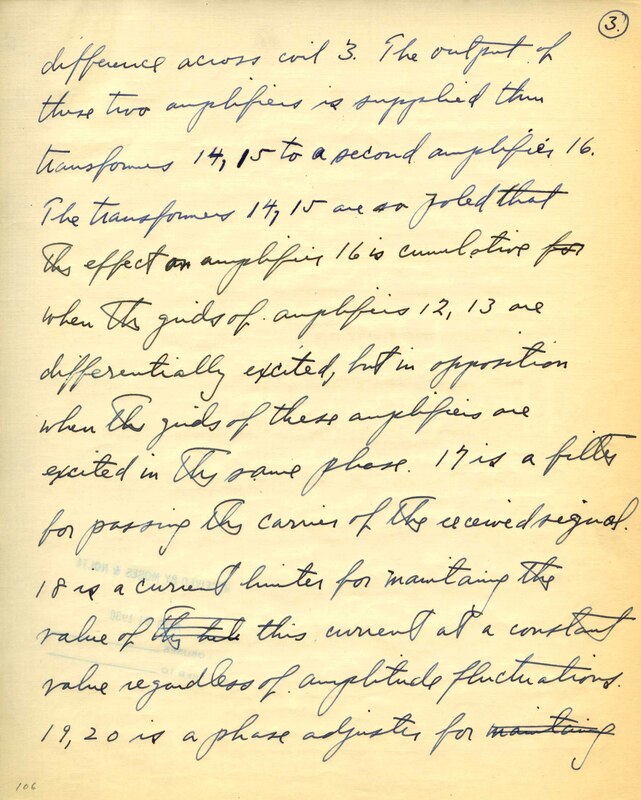 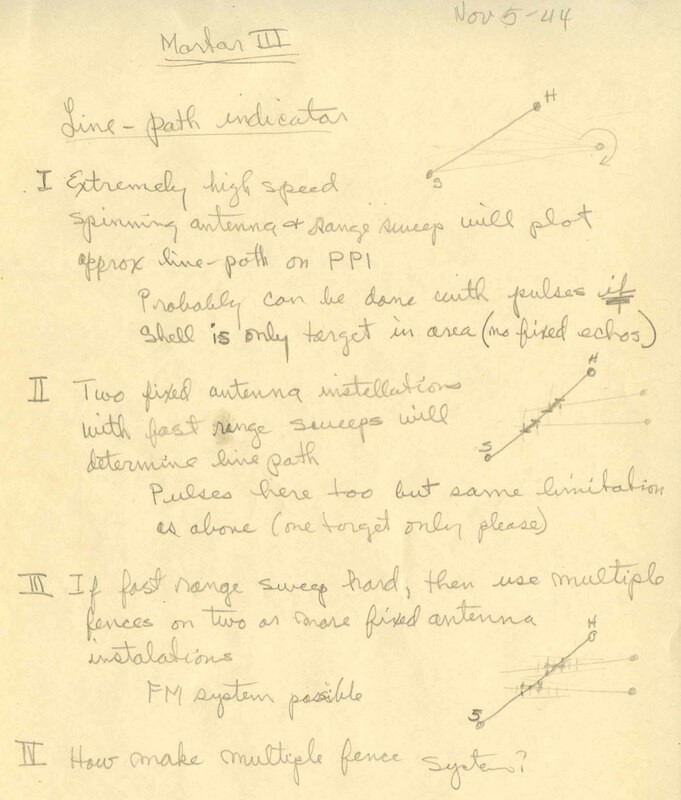 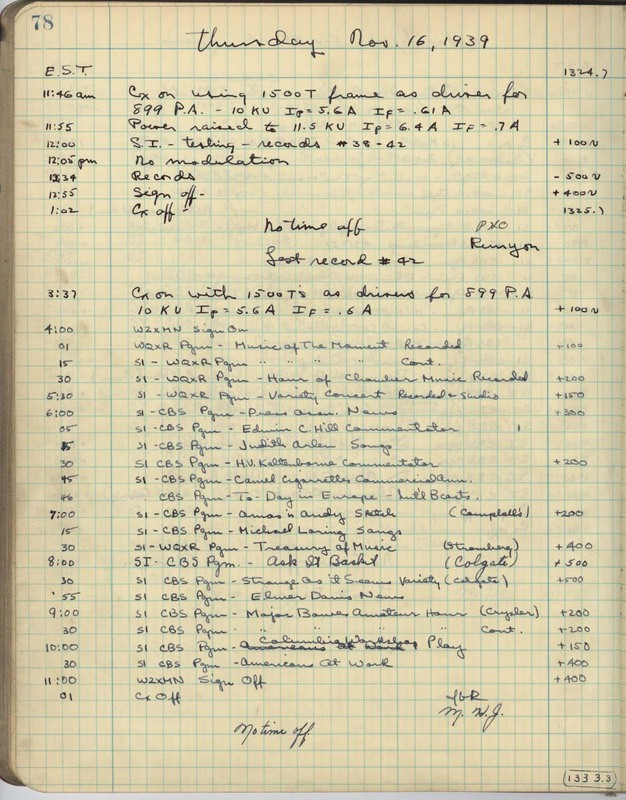 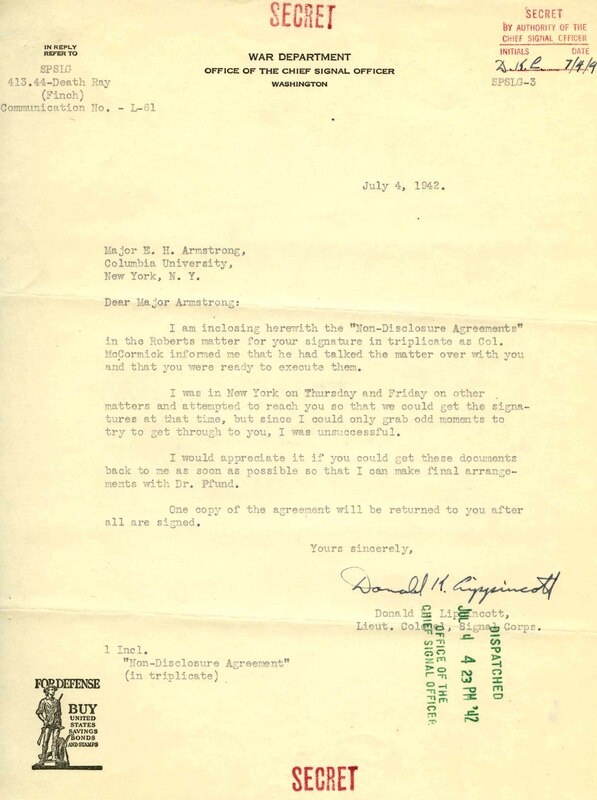 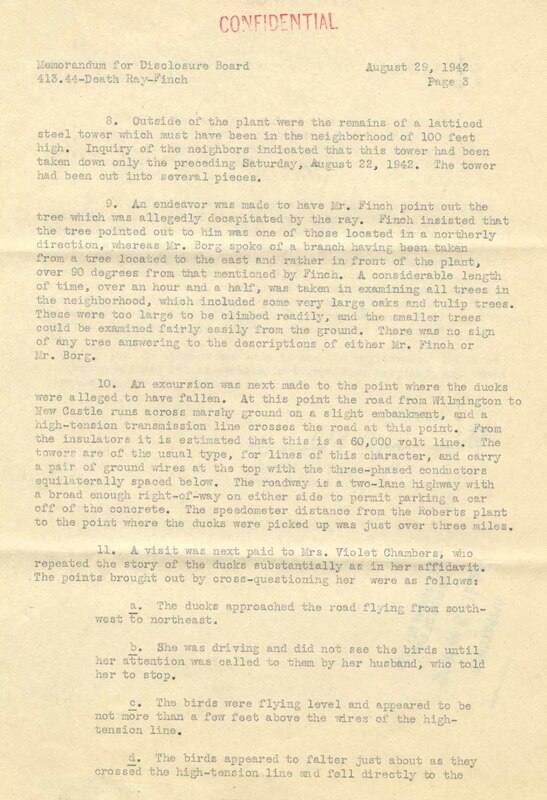 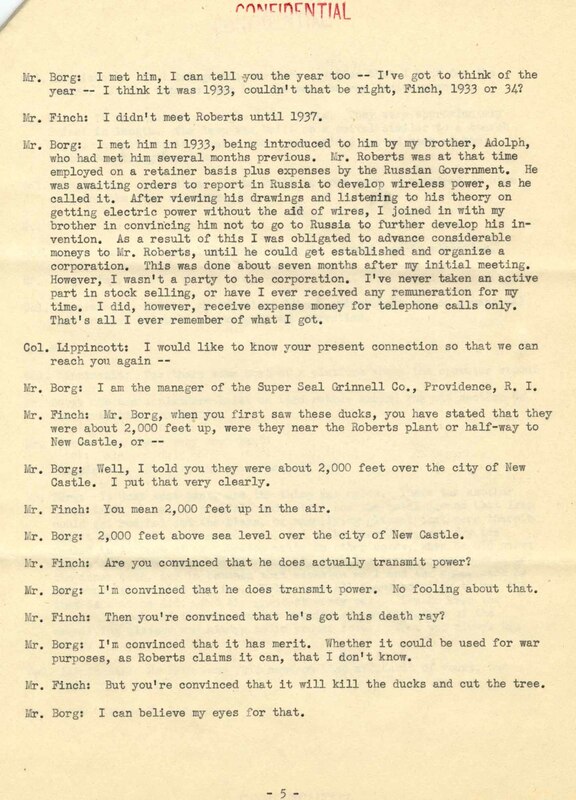 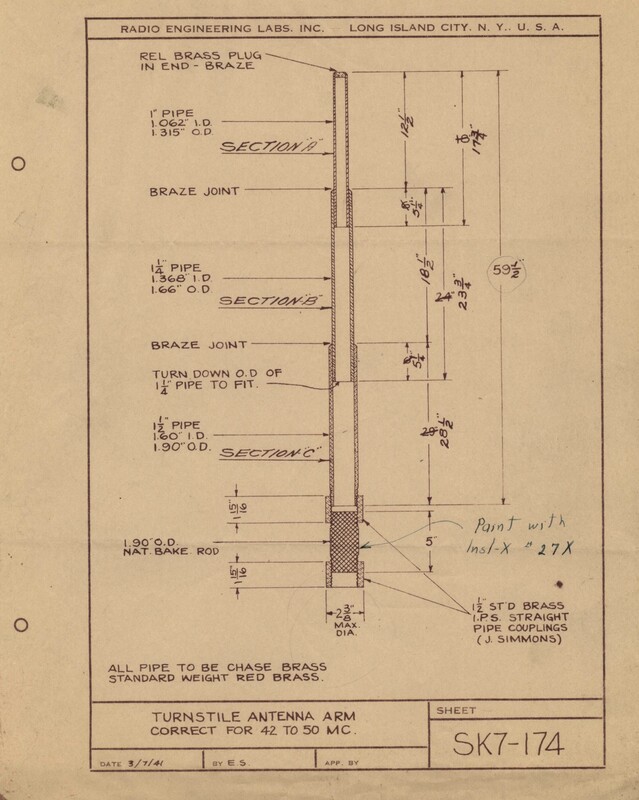 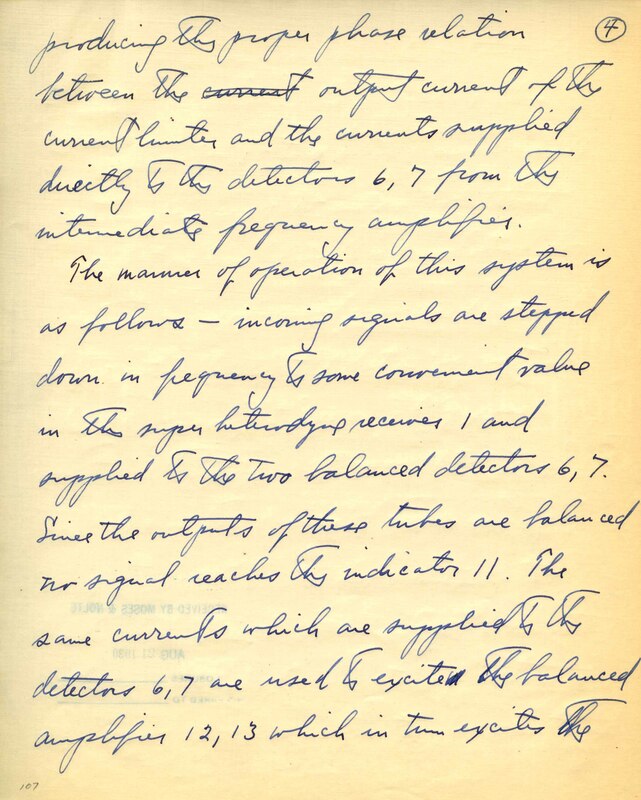 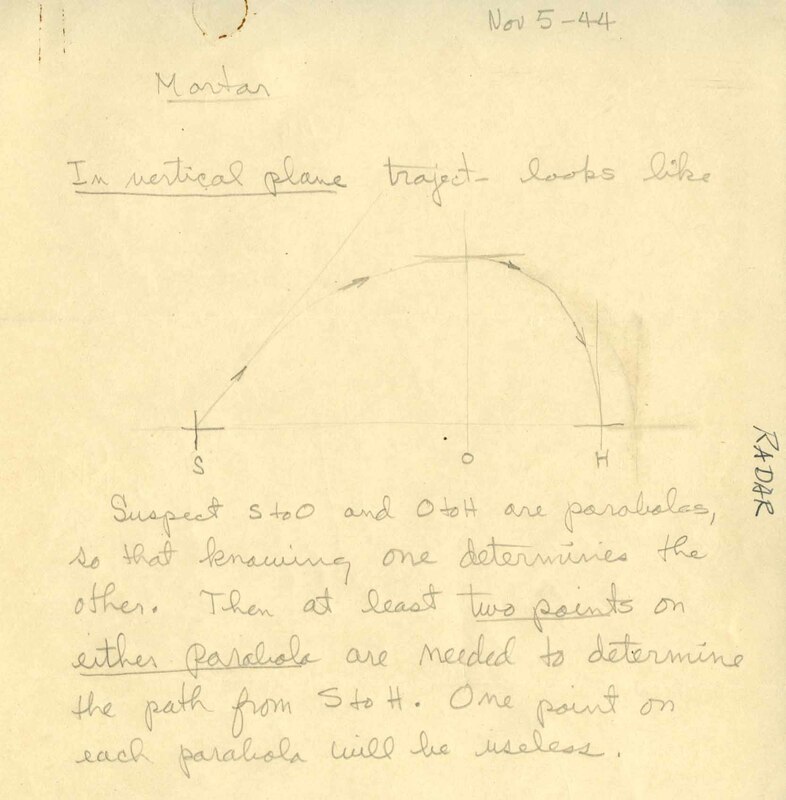 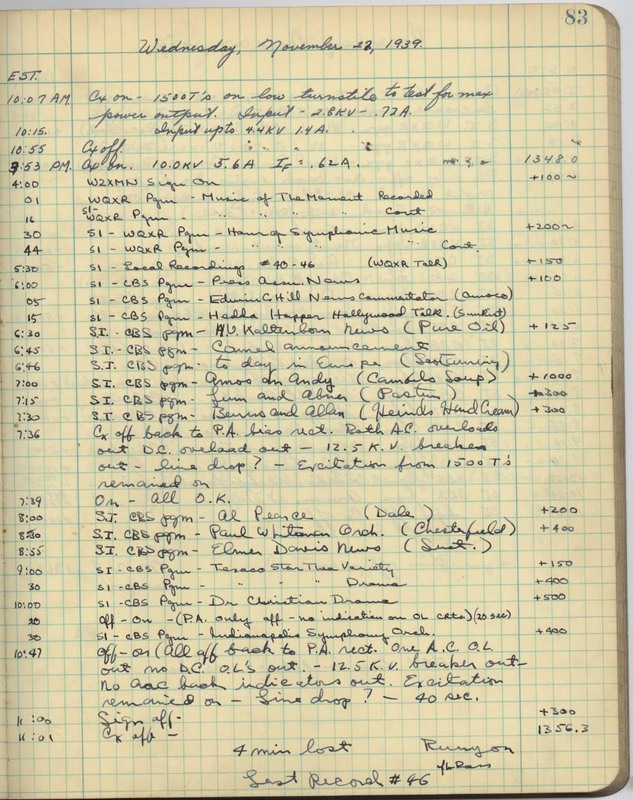 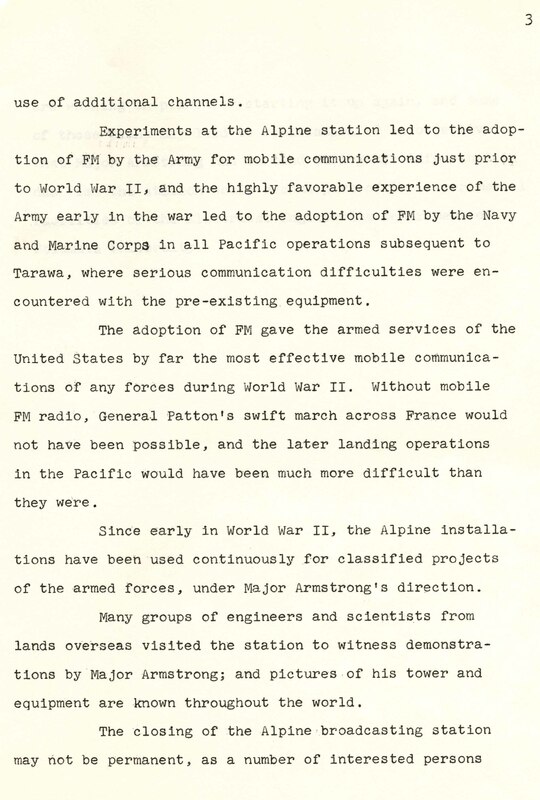 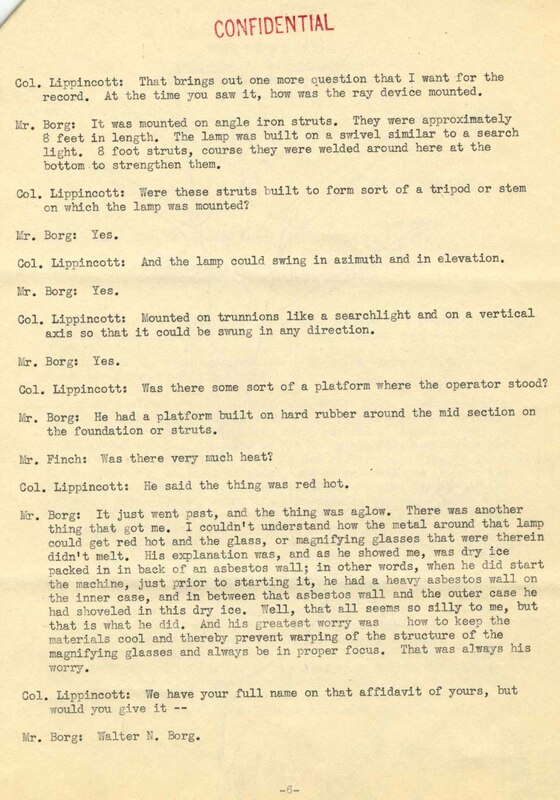 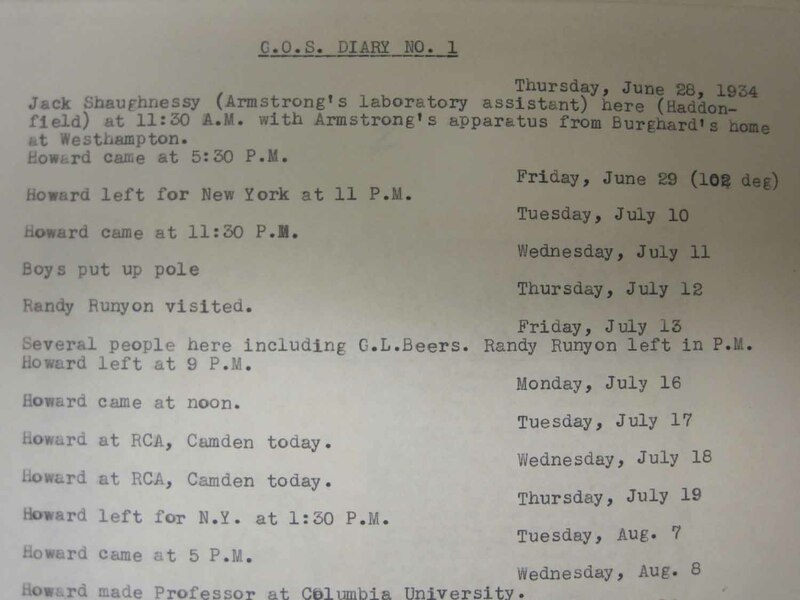 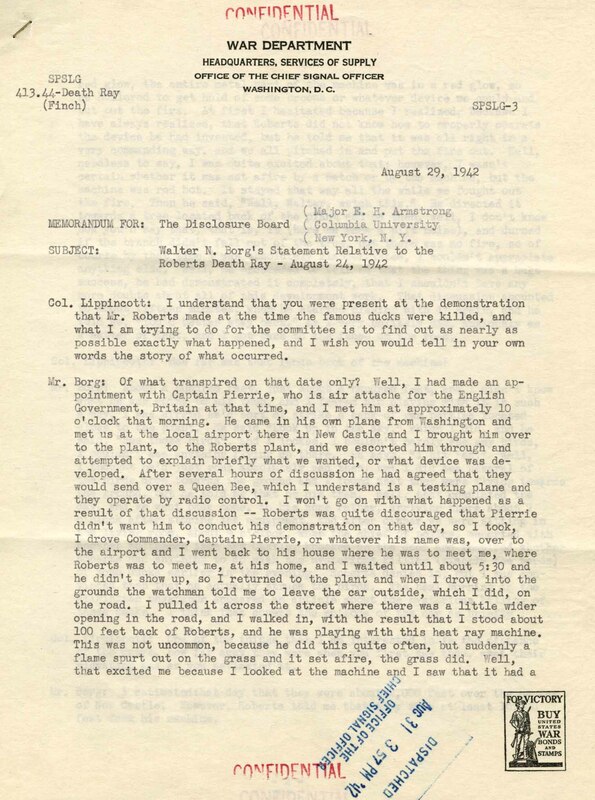 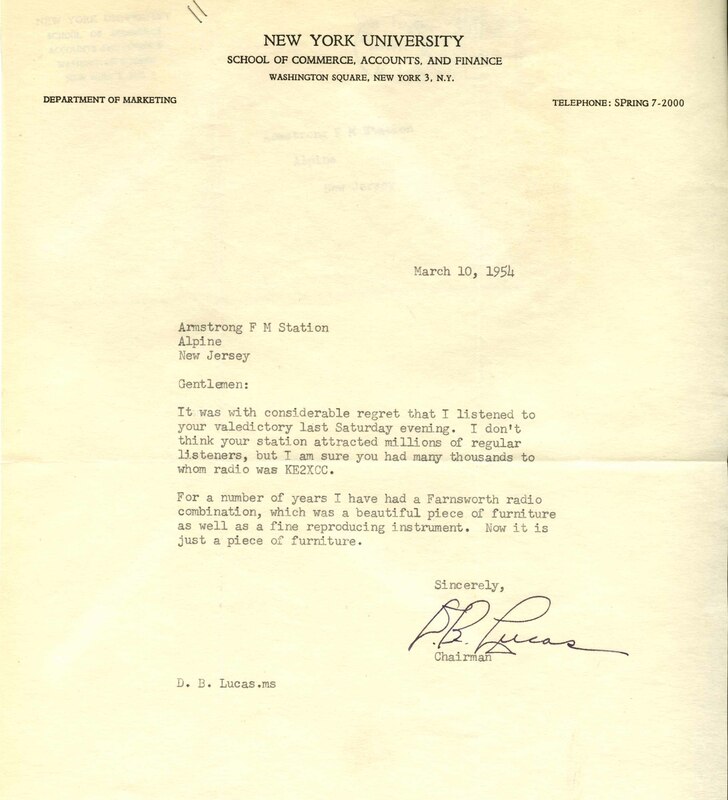 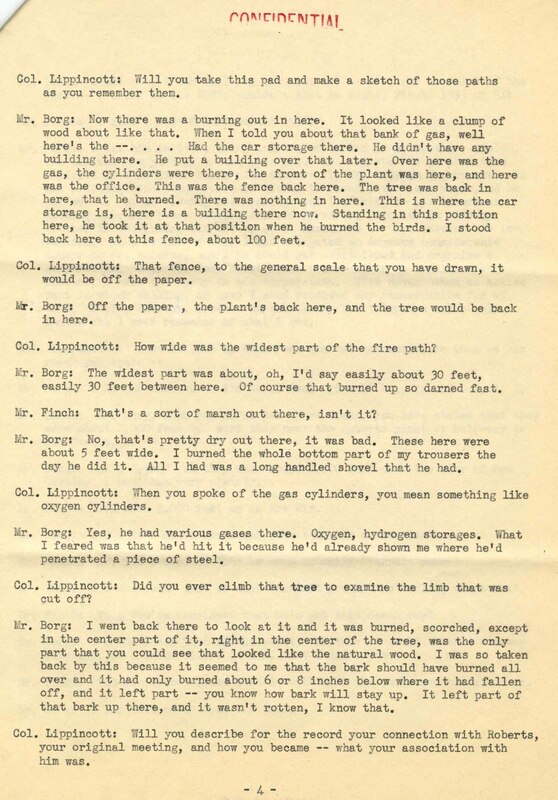 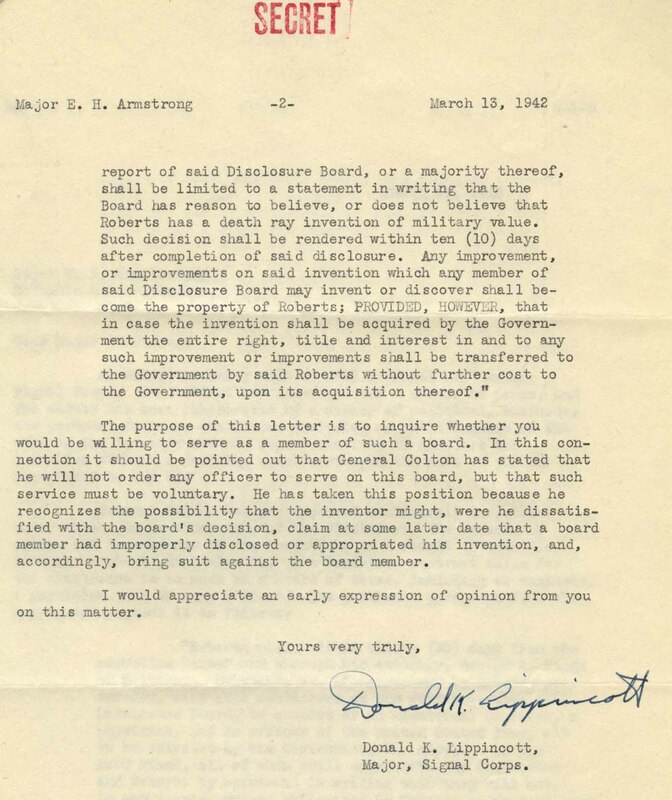 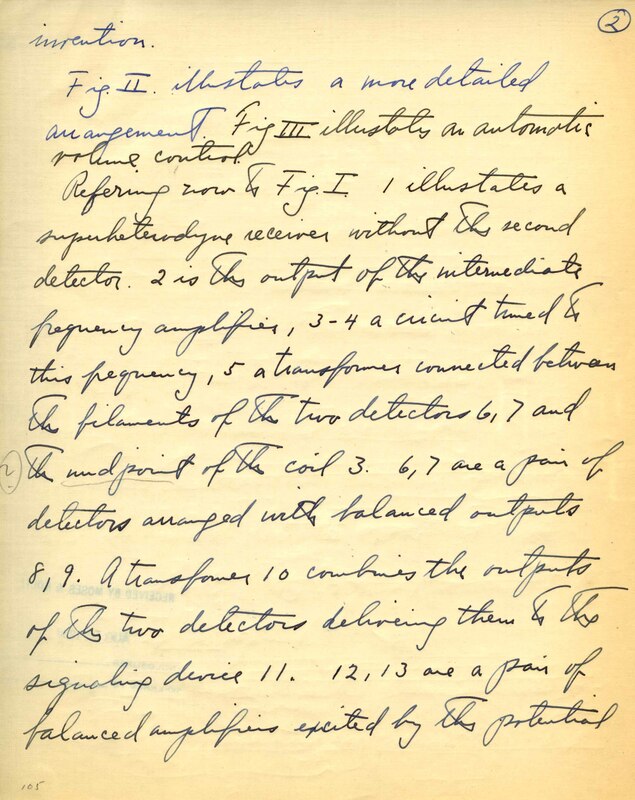 You will see in the documents I have posted here that Armstrong filed for a patent for improvements in "Radio Signaling," through his attorneys Moses & Nolte, on March 26, 1931. 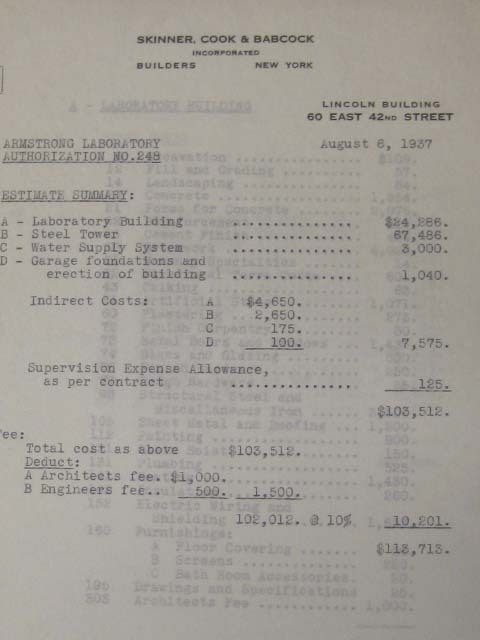 Armstrong’s attorney requested an amendment from Armstrong based on an "office action" from the U.S. Patent Office, where they cite patent number 1,797,317. 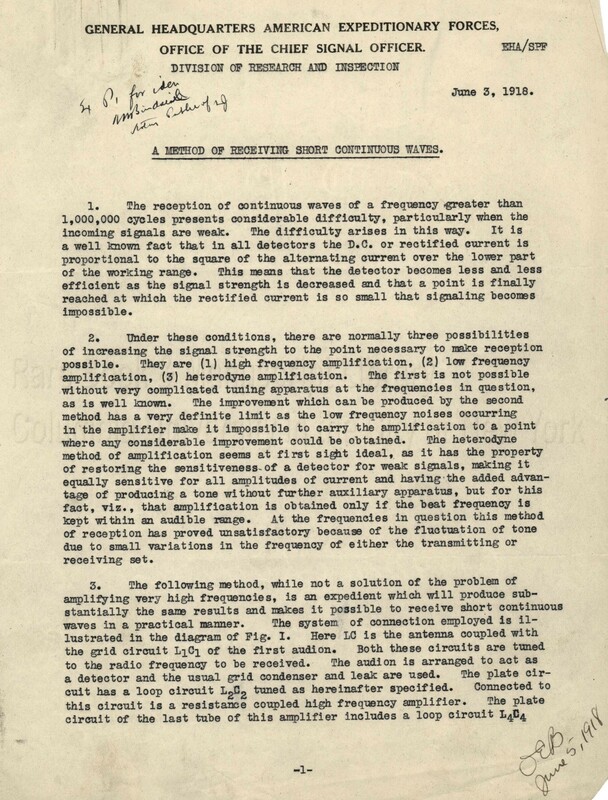 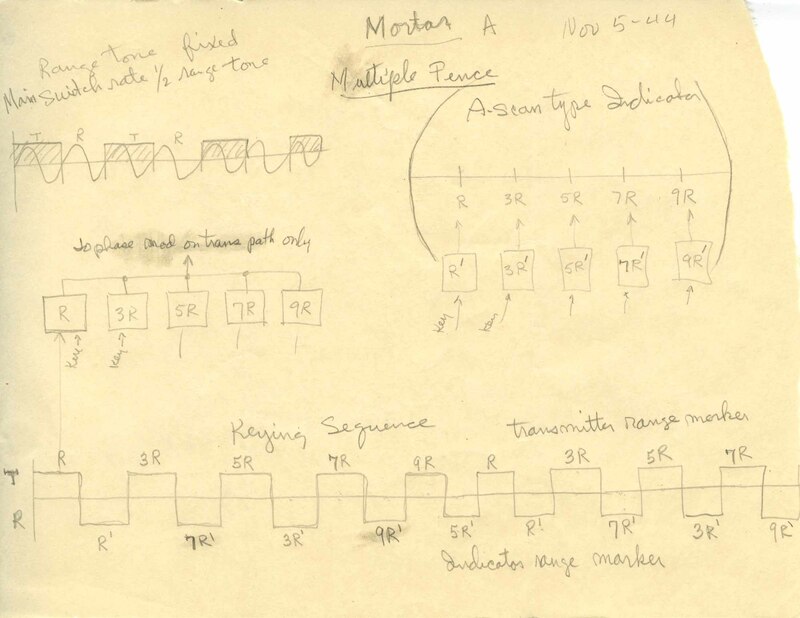 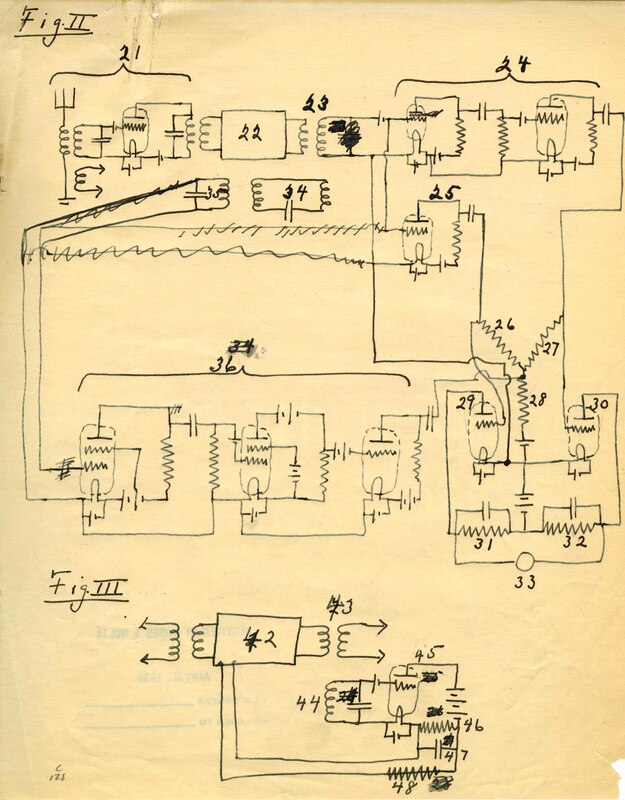 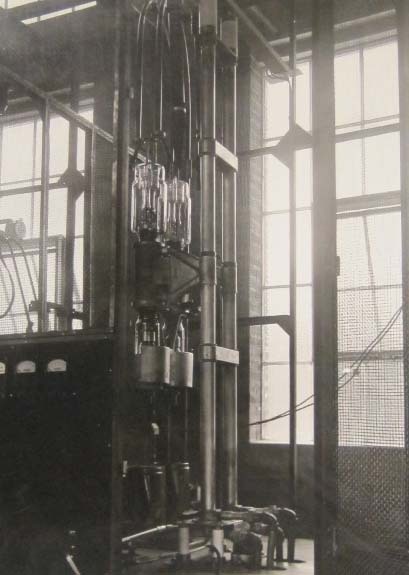 Patent number 1,797,317, titled "Binaural Phase-Discrimination Radio System," was granted on March 24, 1931 to Smart Brand and Pierre Mertz, assignors to American Telephone and Telegraph Company. 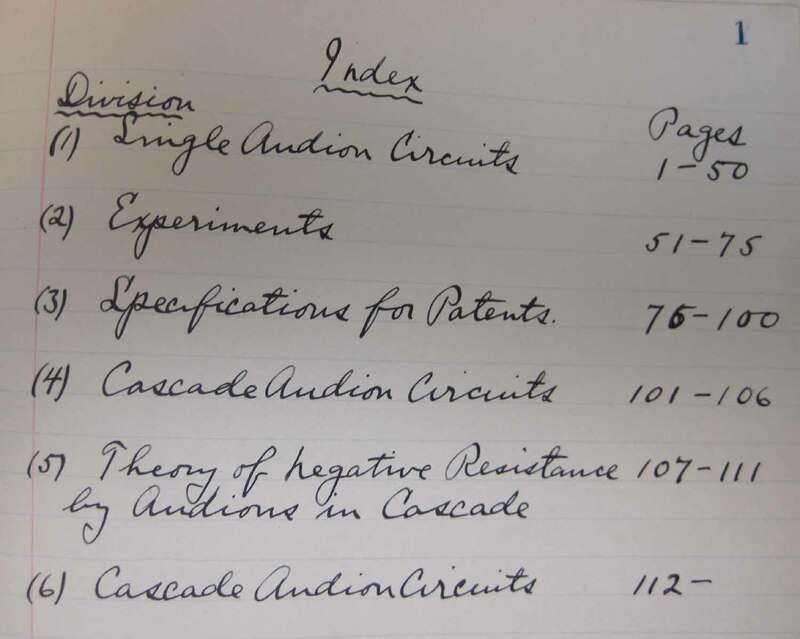 Armstrong’s written disclosure (first four pages) for this patent application, along with accompanying figures, can be seen below. 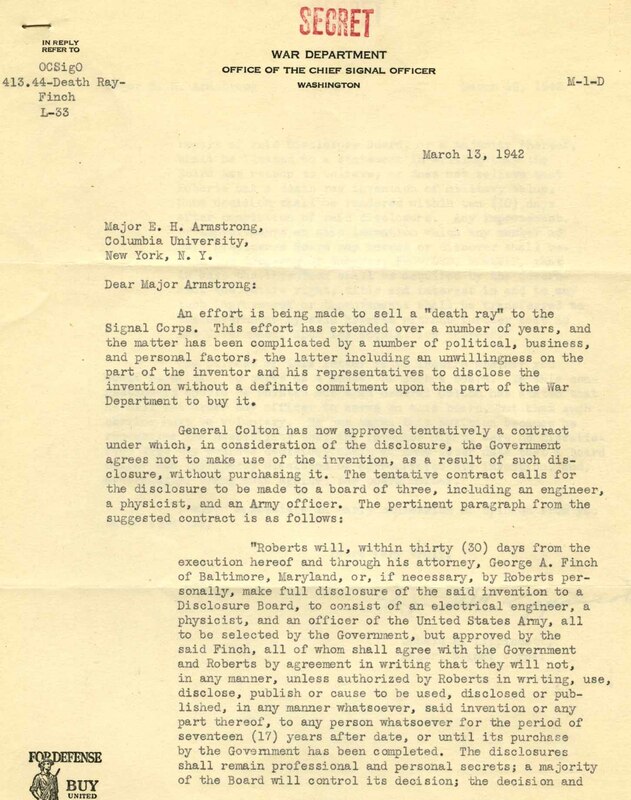 Instead of making the amendment as requested by his attorney, Armstrong decided to let the application drop. 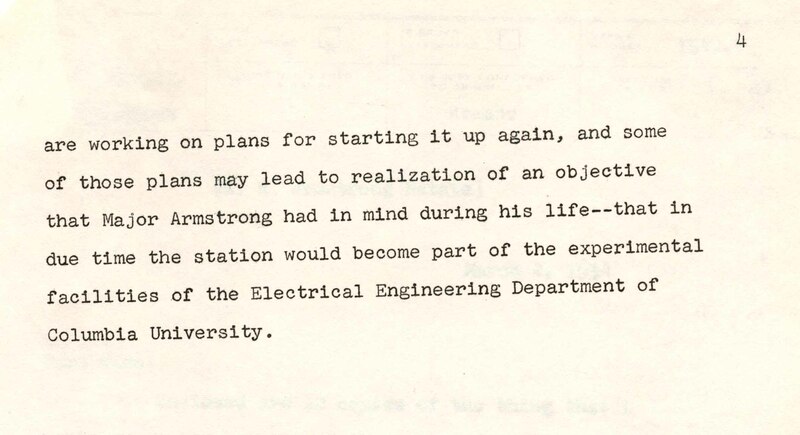 From reading Armstrong’s patents listed earlier, I can not tell if this dropped application was rewritten into alternate Armstrong patent. 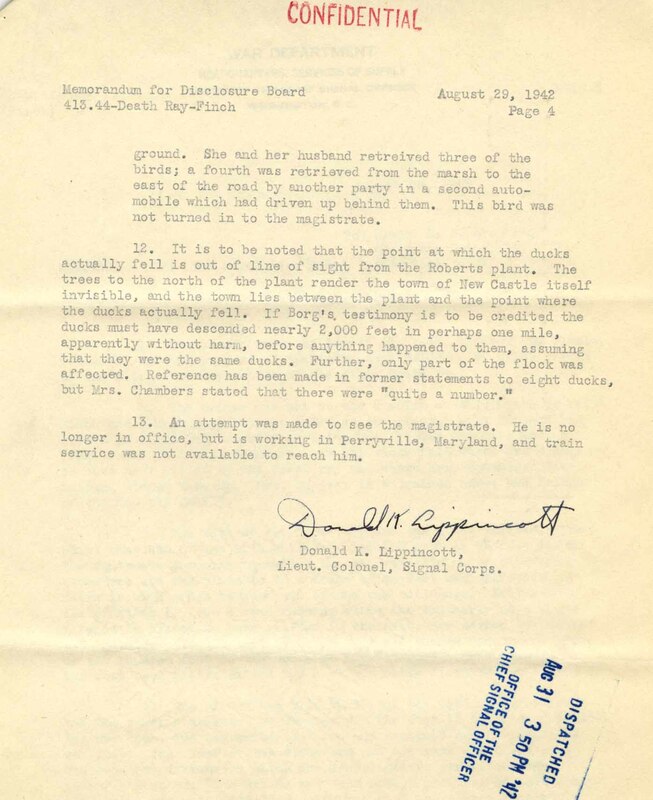 Perhaps someone can shed some light on this? 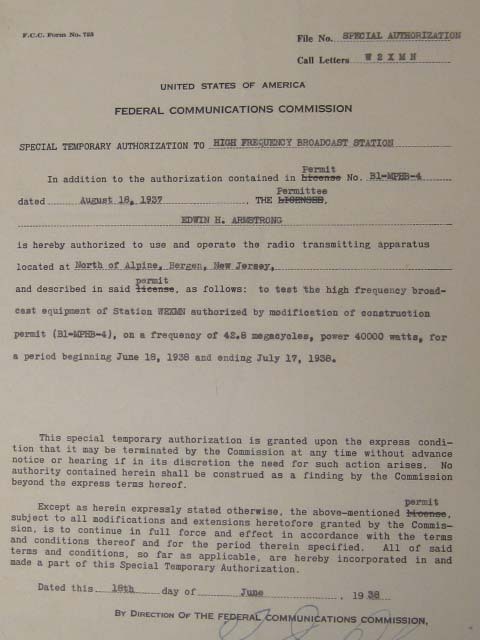 This entry was posted in Popular and tagged American Telephone and Telegraph, Moses & Nolte, Pierre Mertz, Radio Broadcasting and Receiving, Radio Signaling, Radio Signaling System, Radio Telephone Signaling, Smart Brand, United States Patent Office on November 1, 2010 by Jennifer Comins. 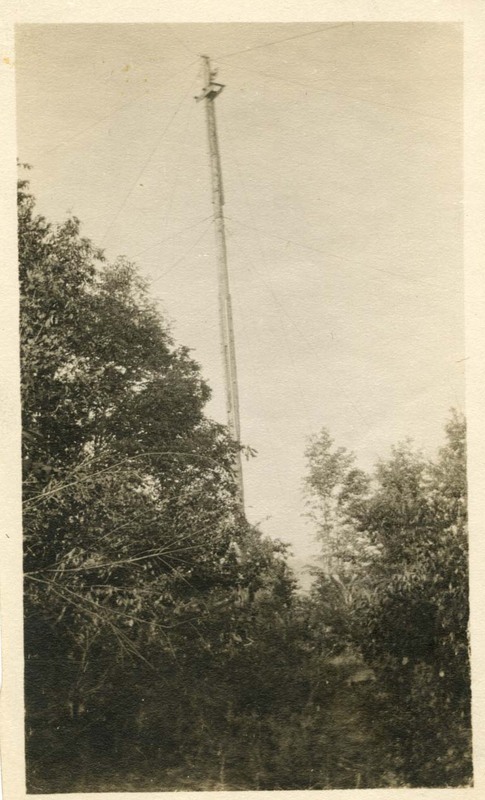 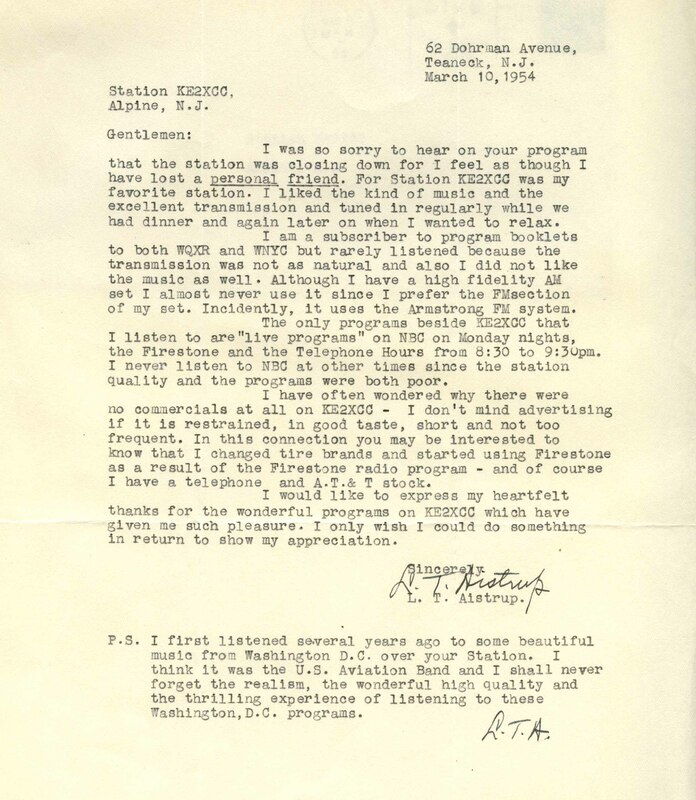 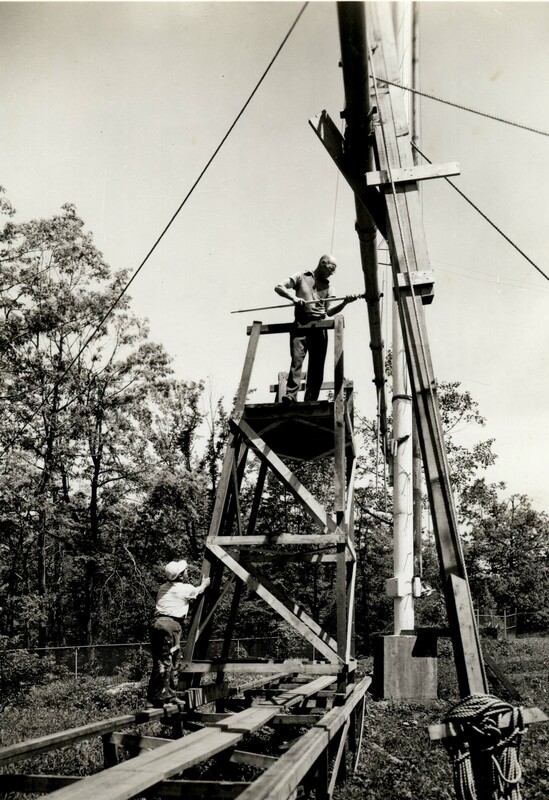 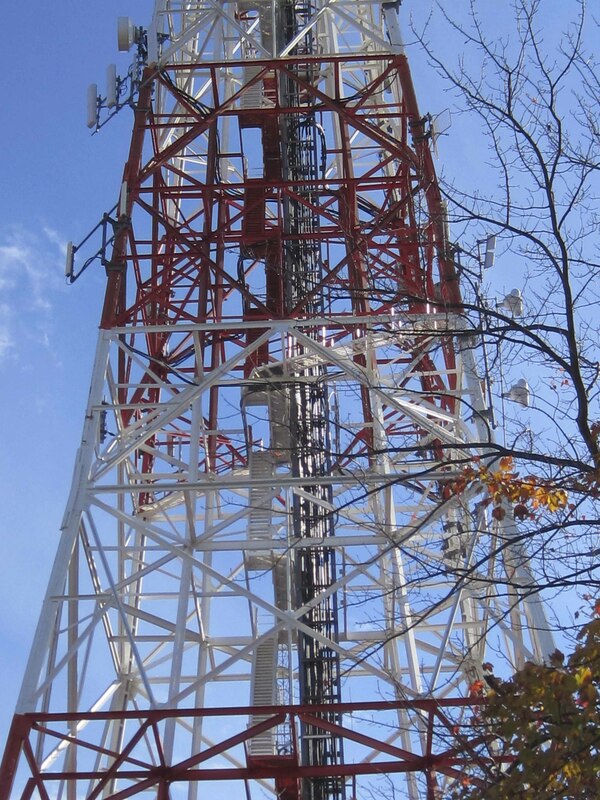 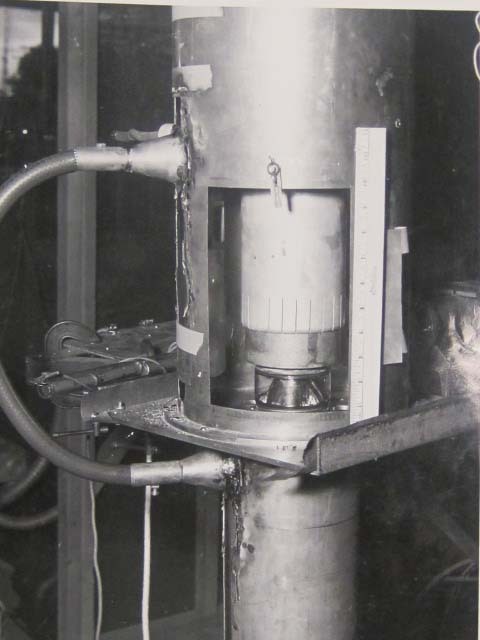 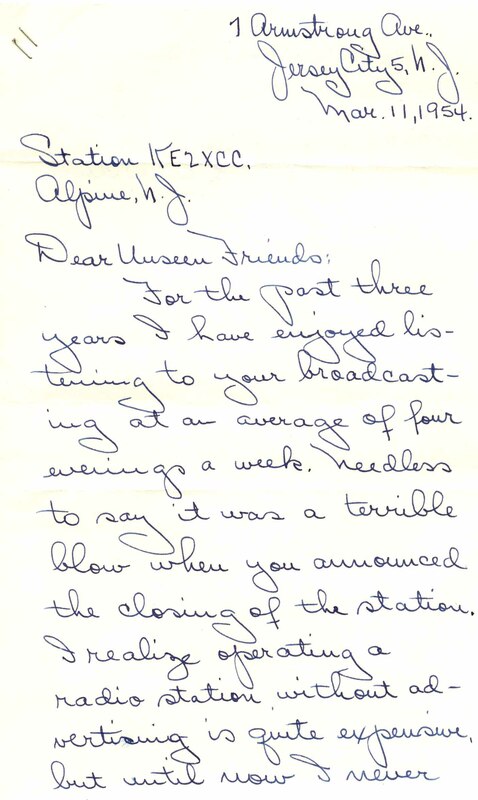 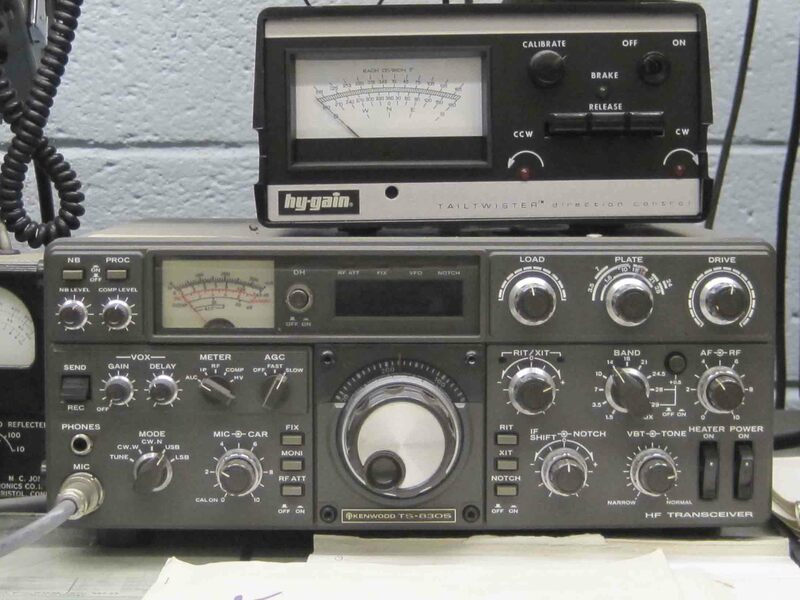 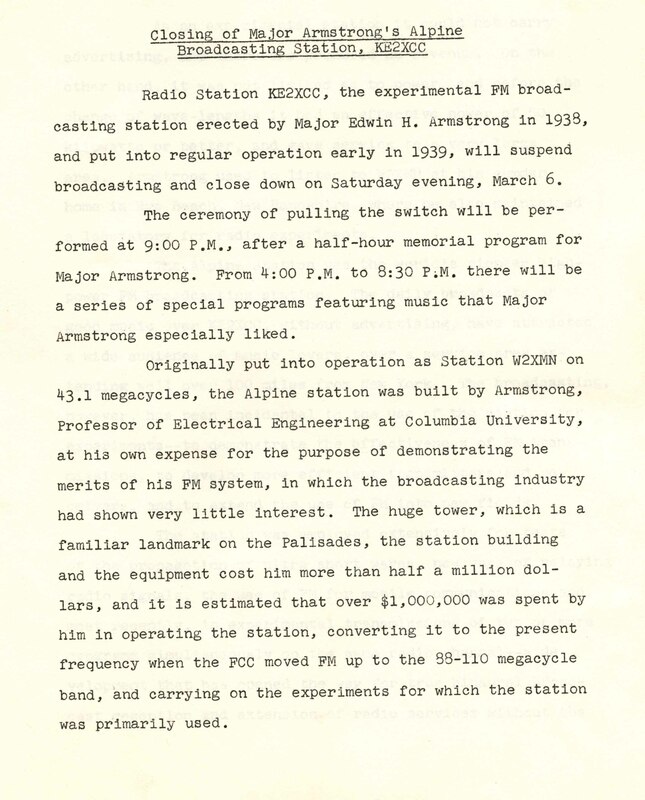 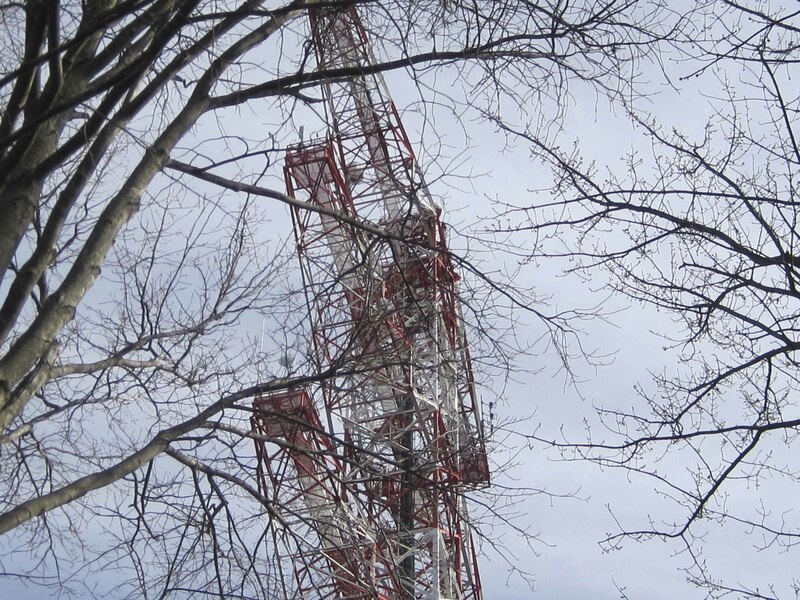 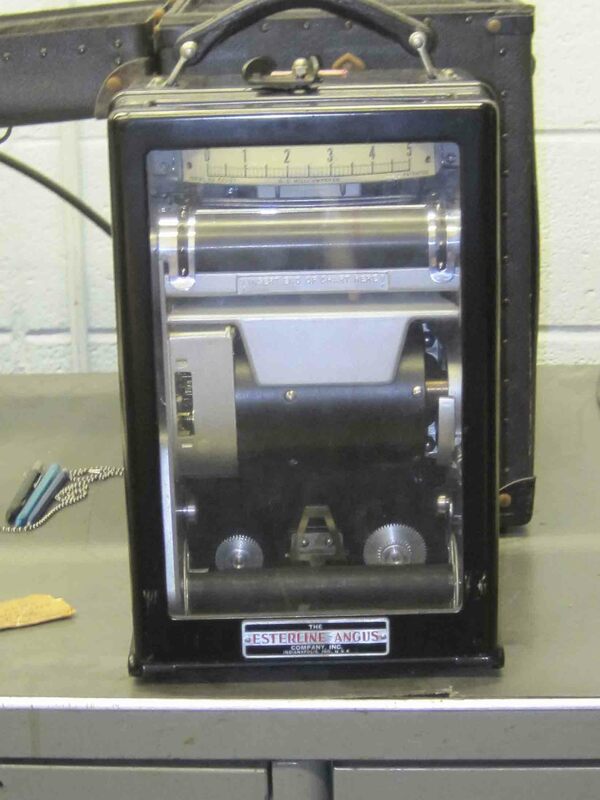 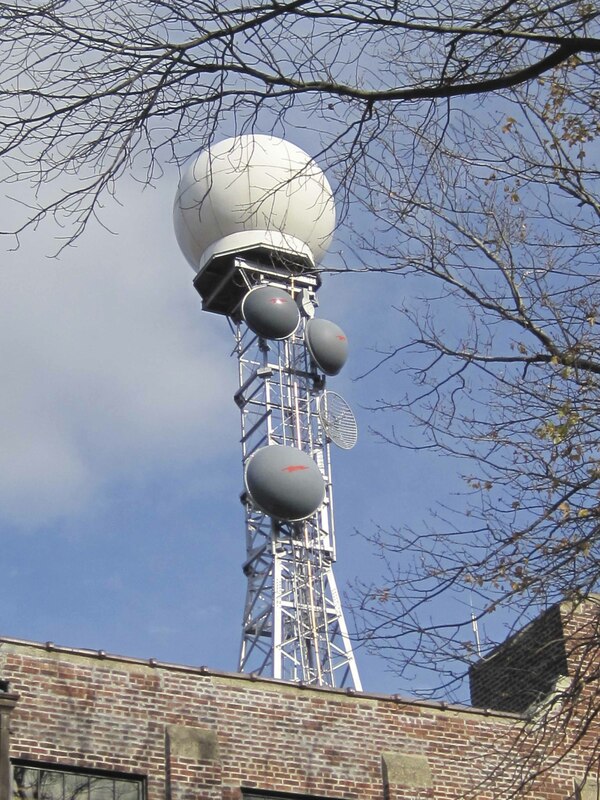 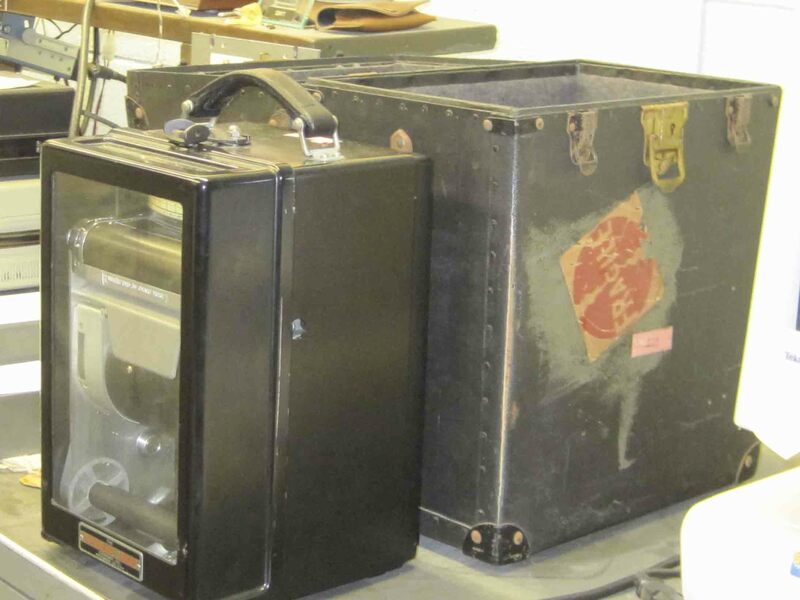 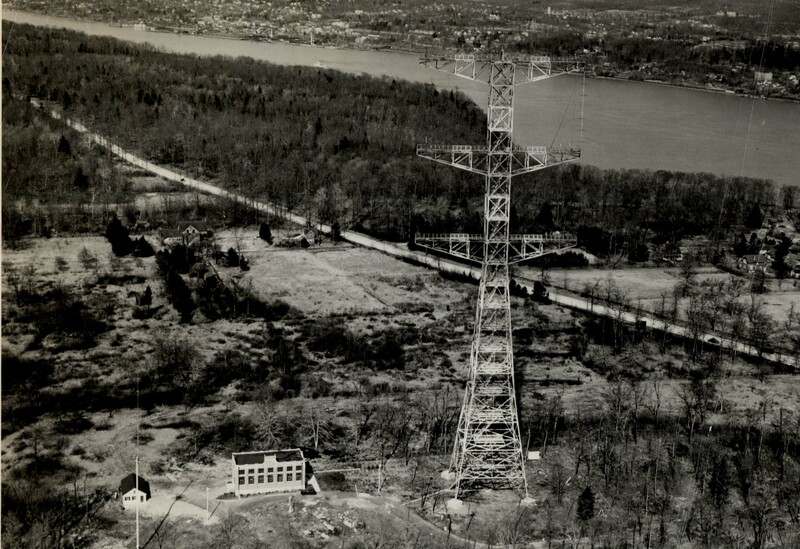 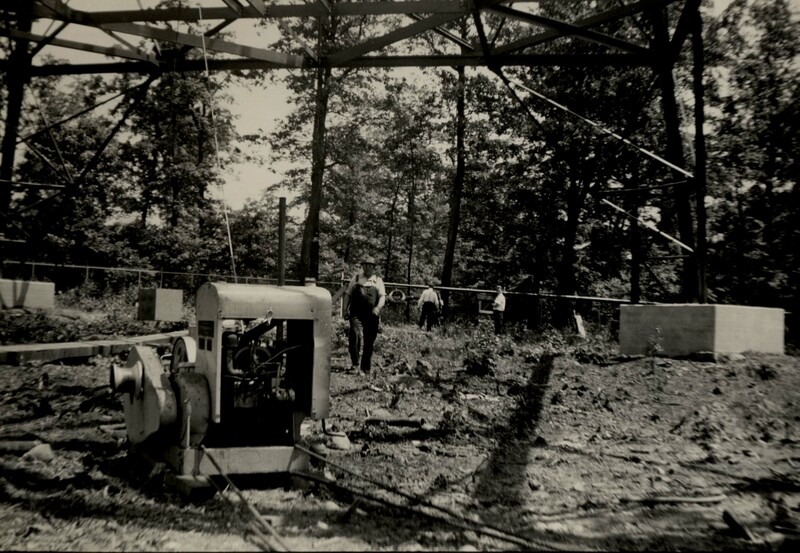 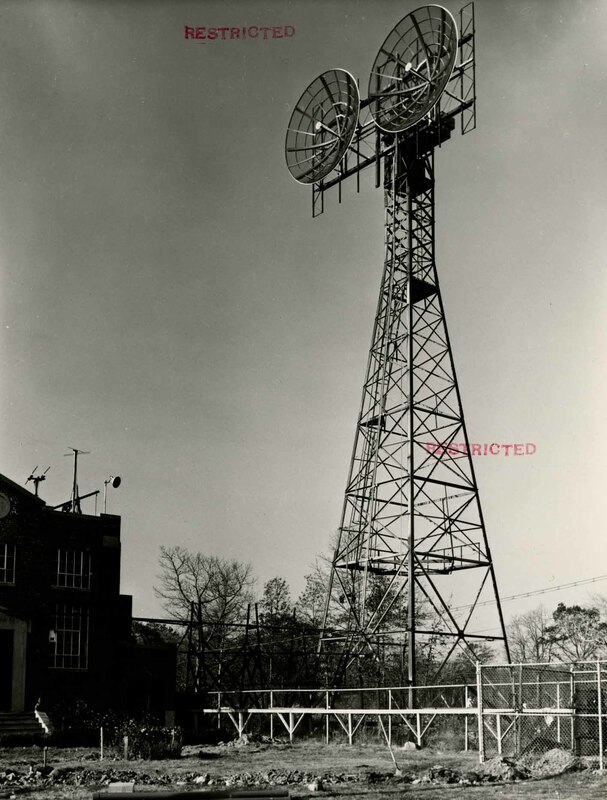 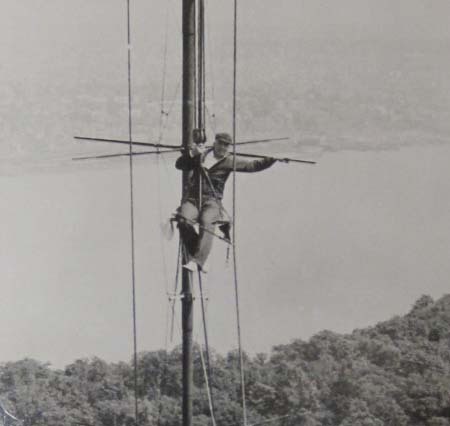 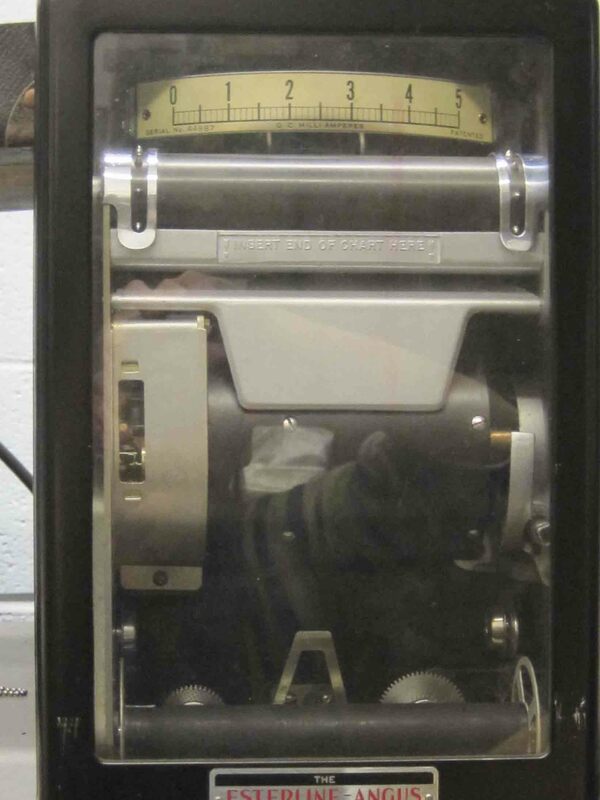 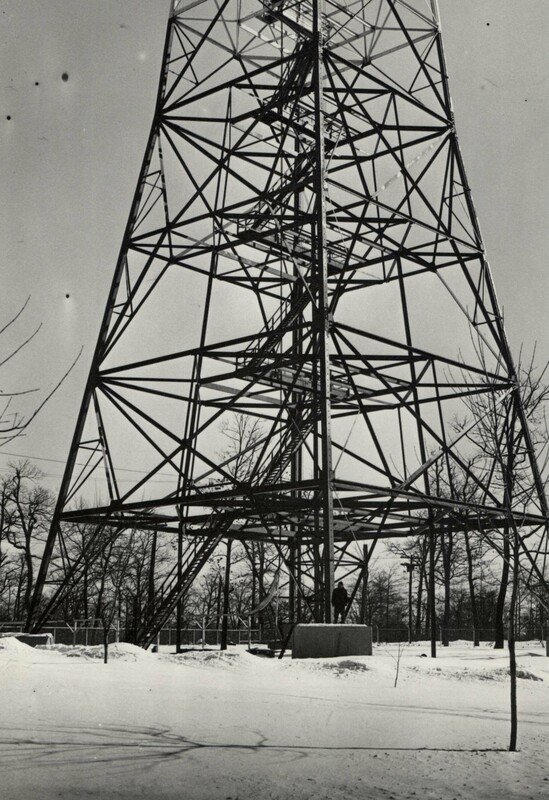 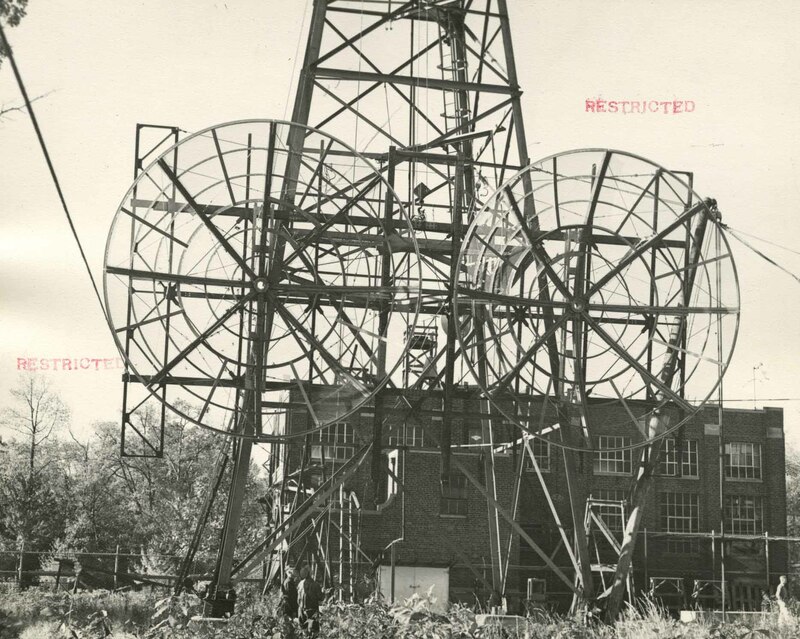 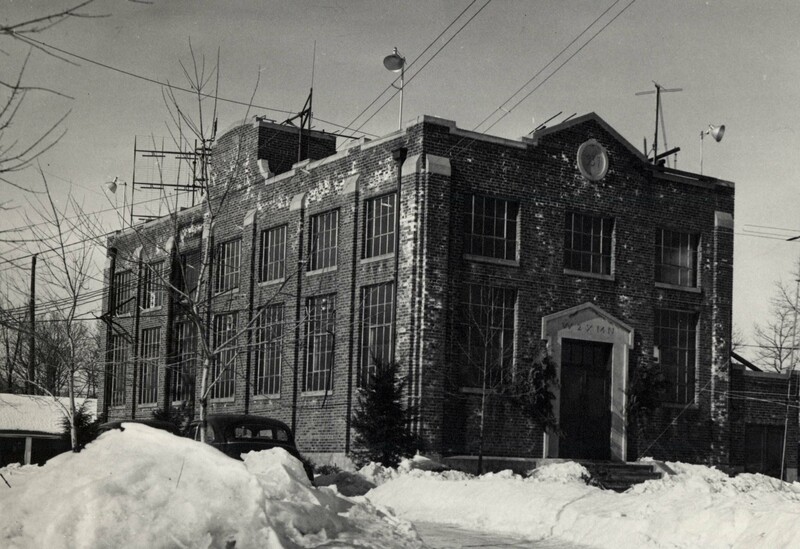 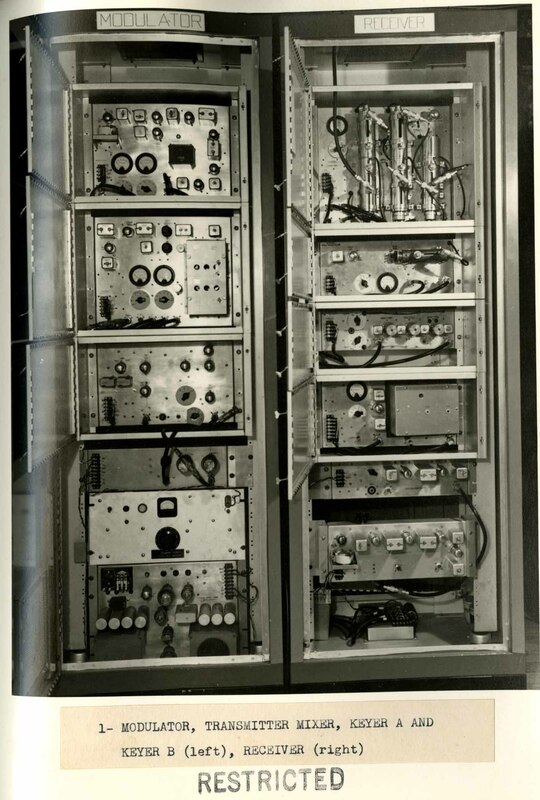 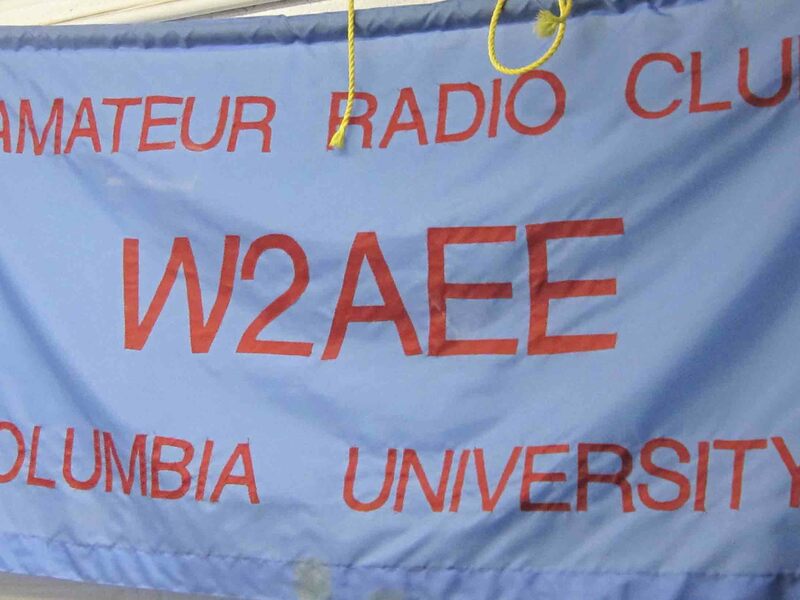 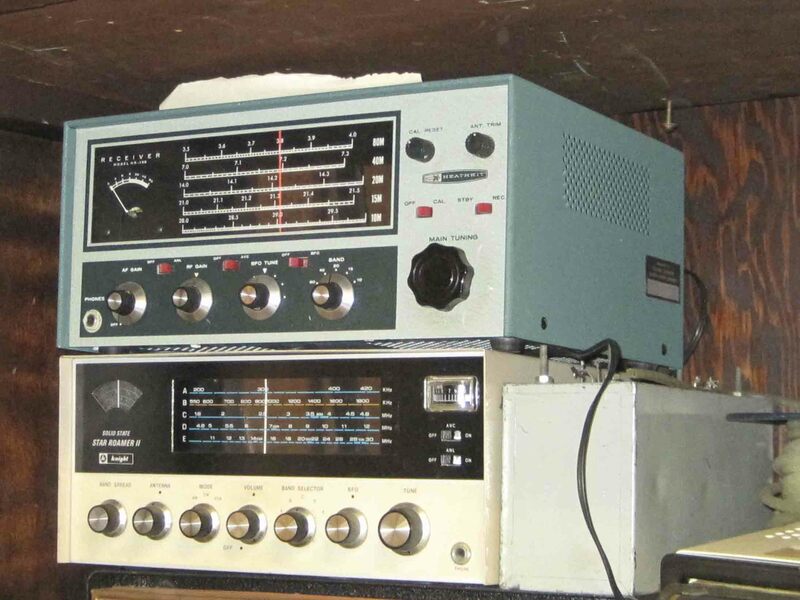 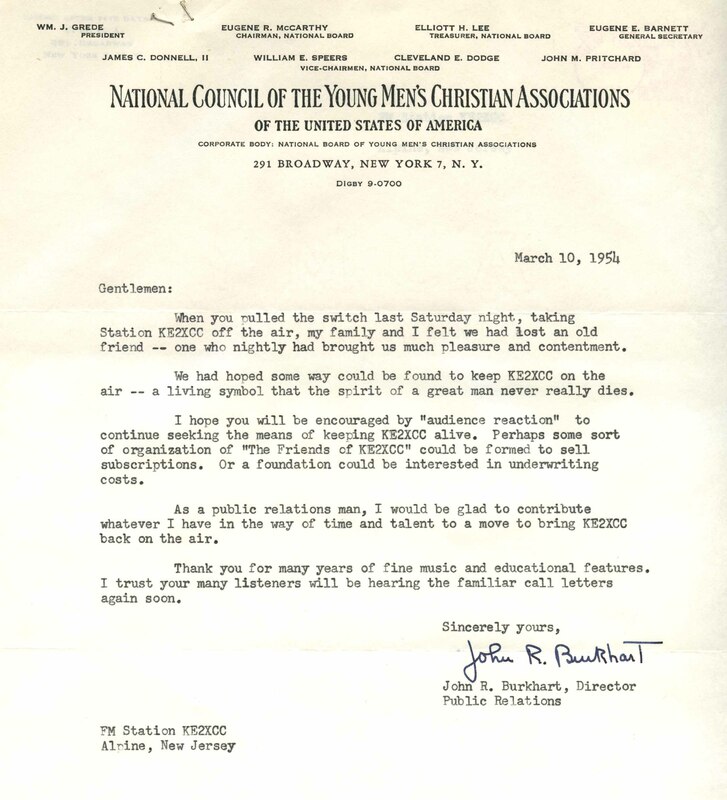 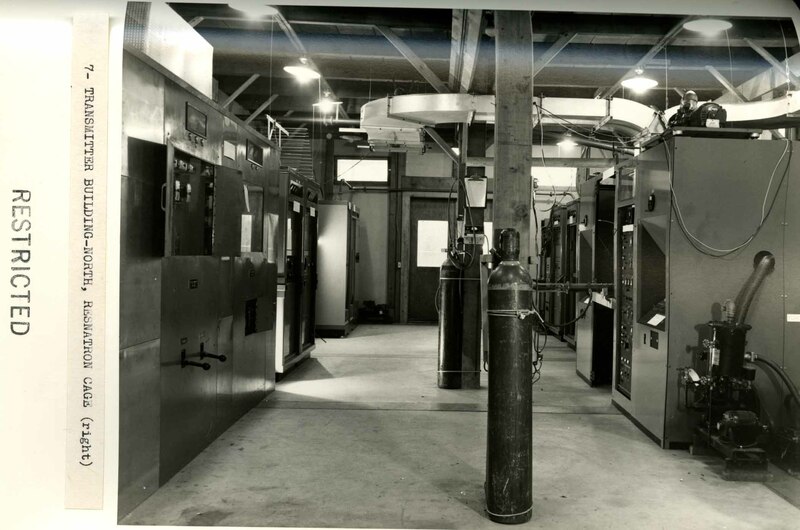 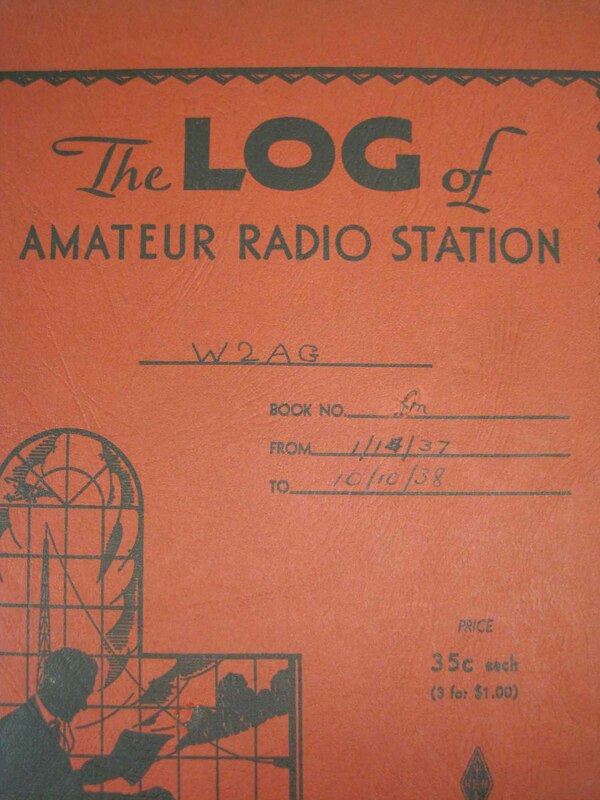 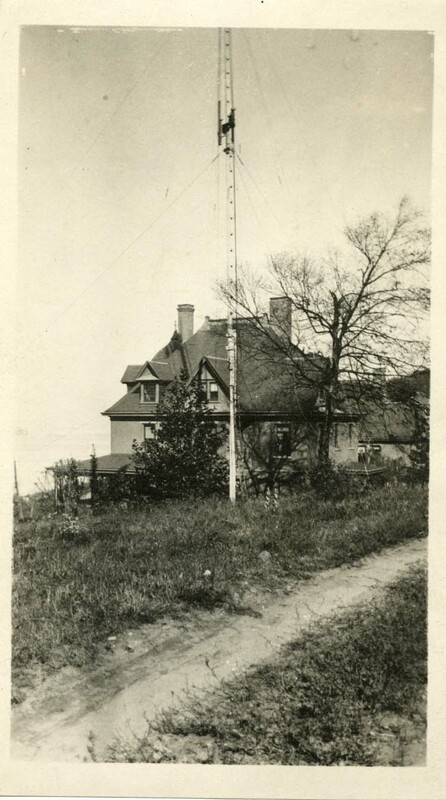 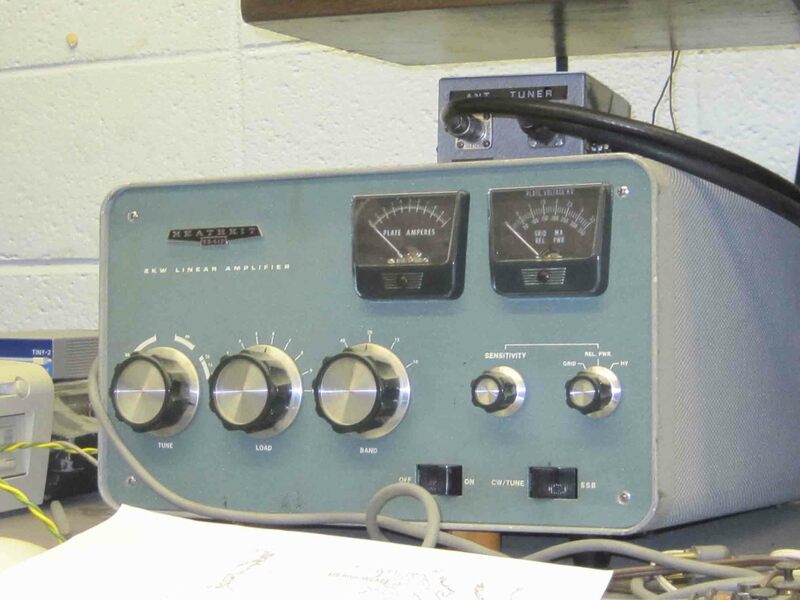 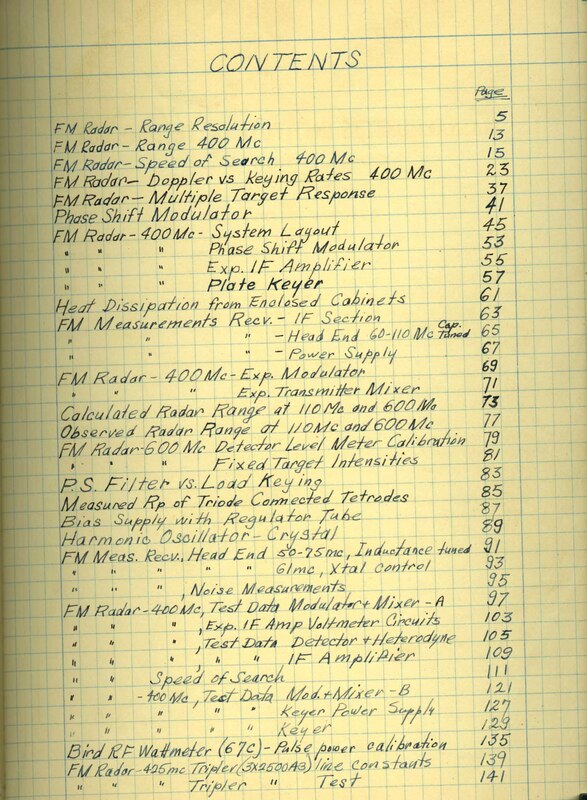 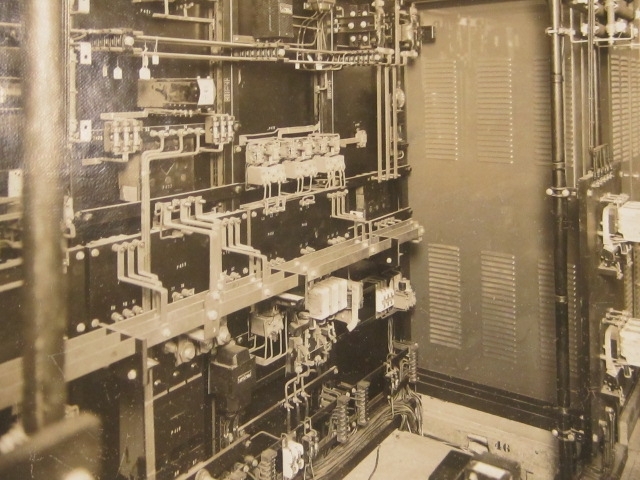 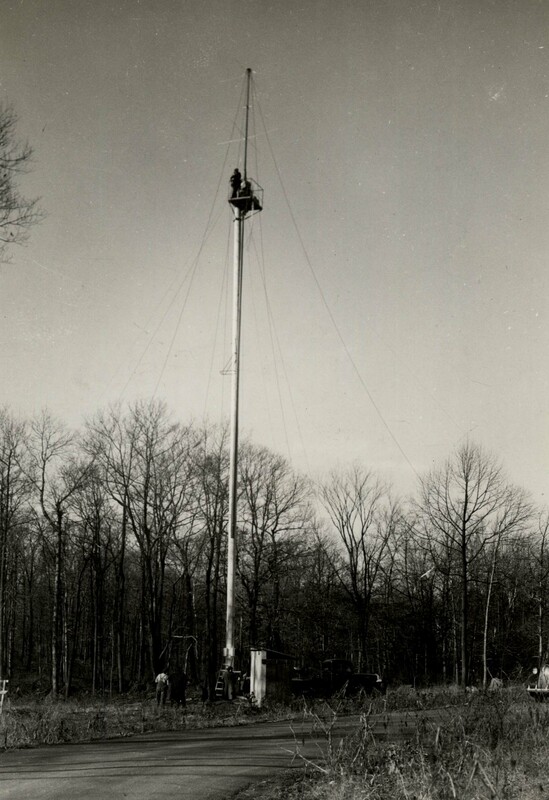 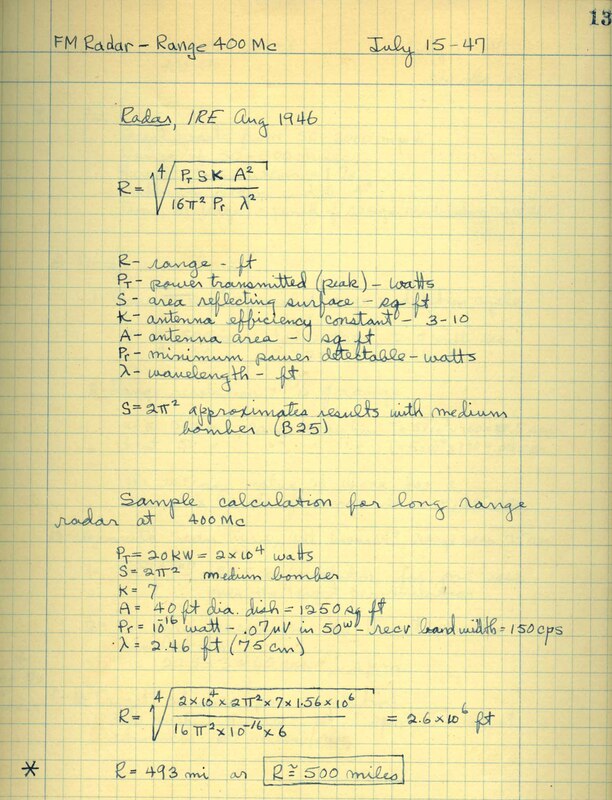 On March 6, 1954, the first experimental FM station, KE2XCC (W2XMN), at Alpine, New Jersey, went off the air. 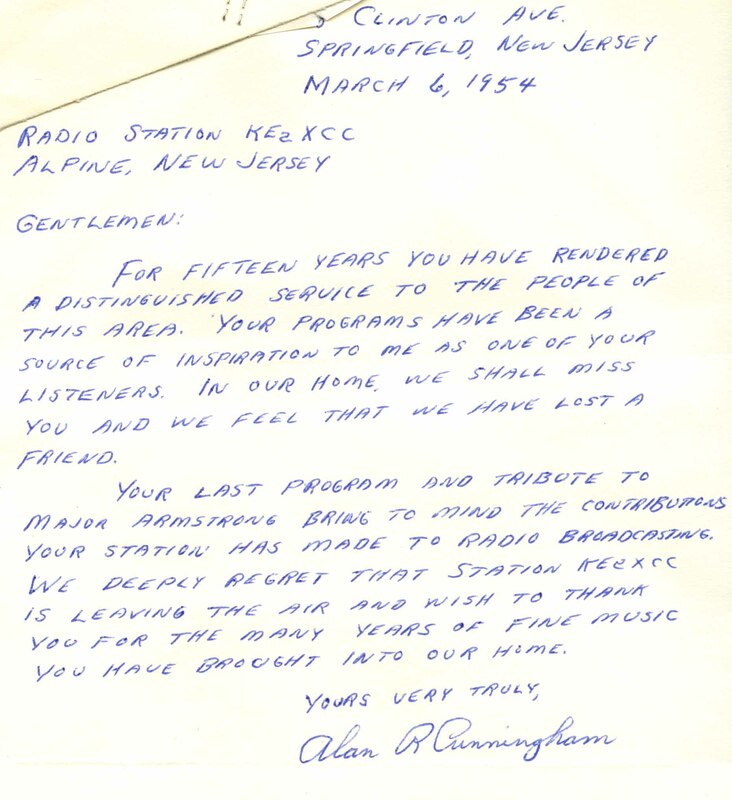 Armstrong’s station had been broadcasting for over fifteen years– it was the end an an era. 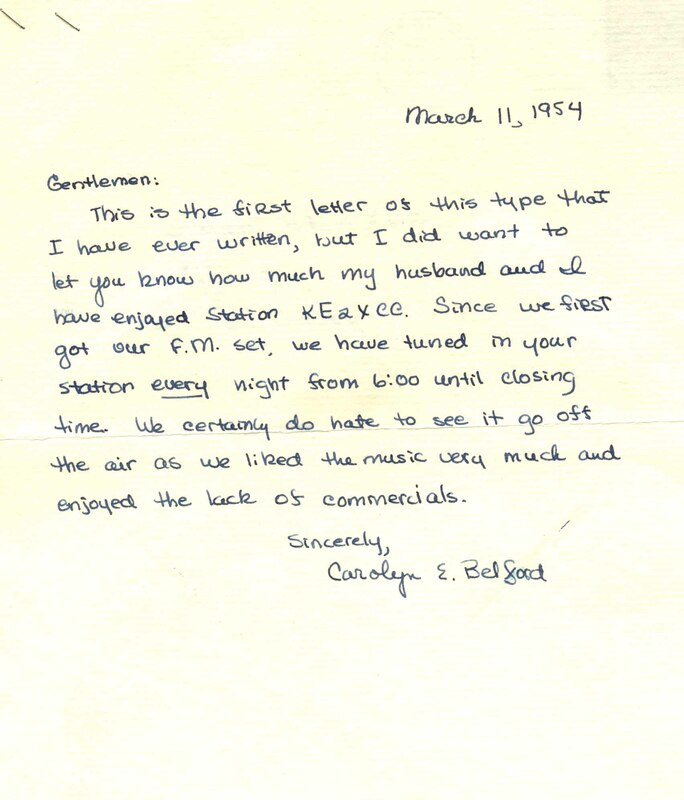 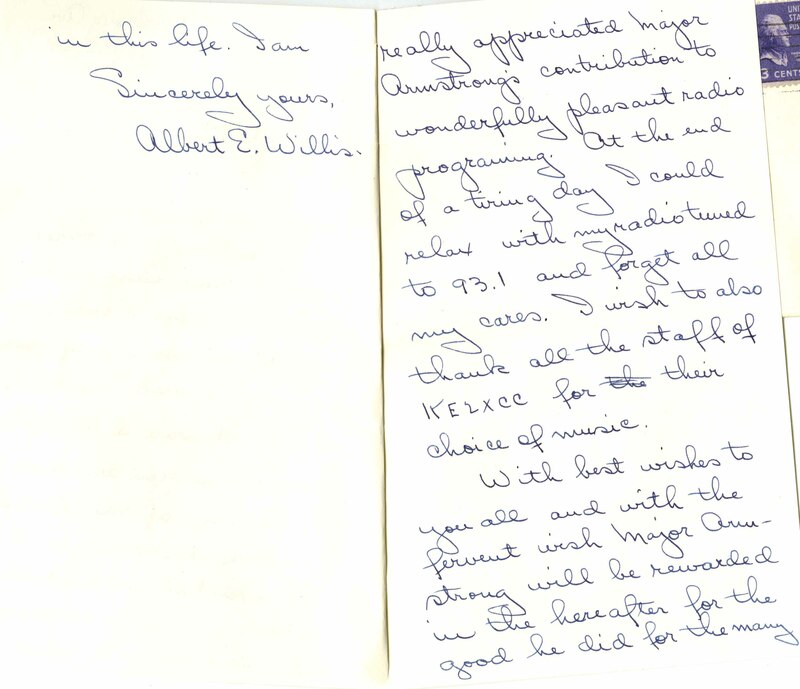 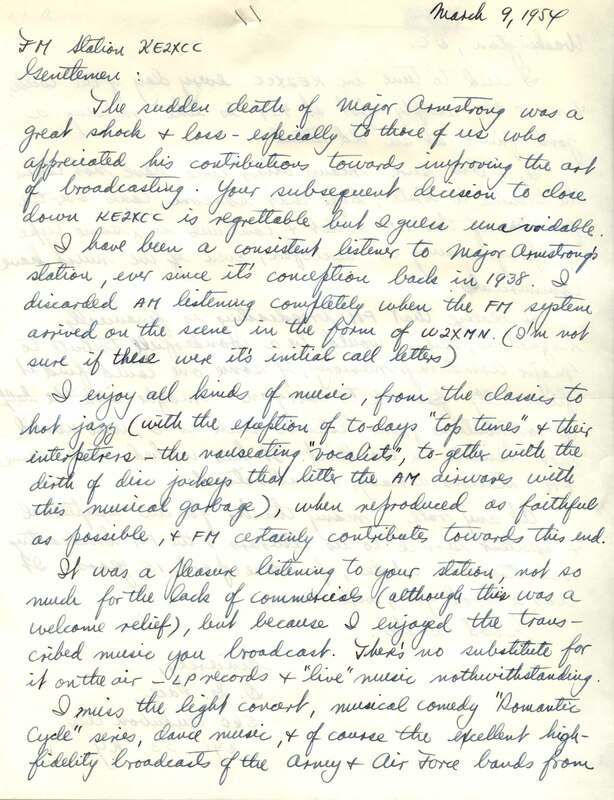 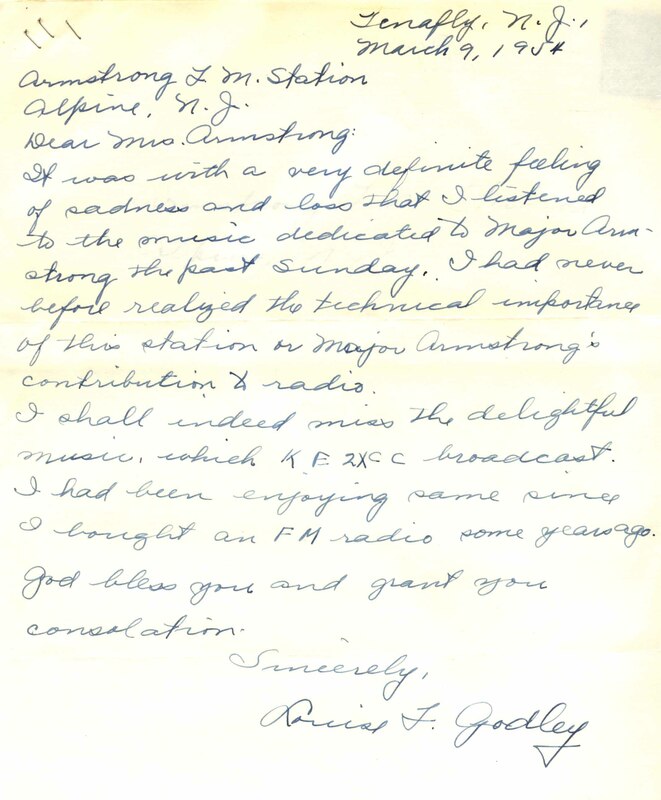 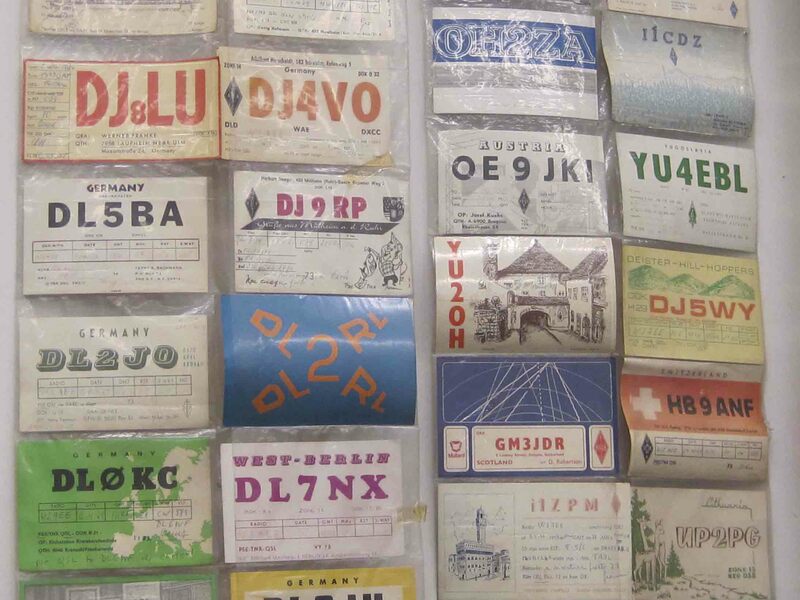 I had come across quite a number of letters written to Station KE2XCC from listeners expressing great loss when the station closed. 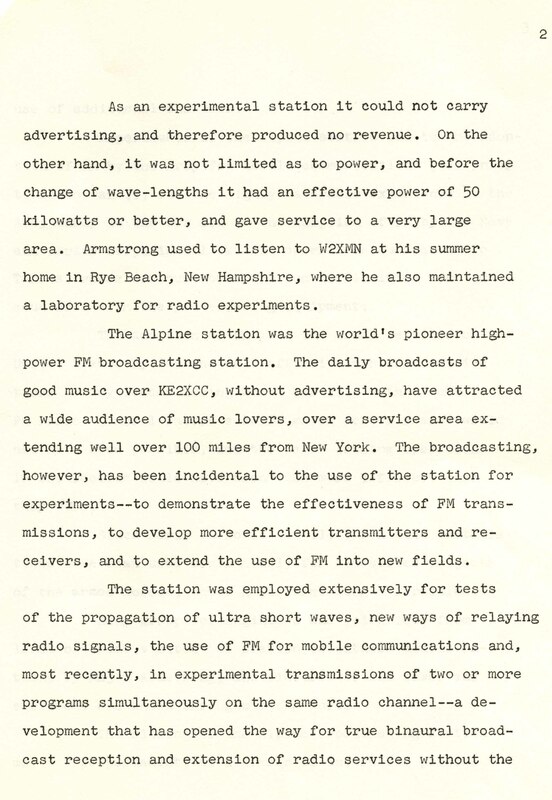 It should be recognized that for all the years Armstrong broadcast from Alpine, not one commercial was heard by his listeners. 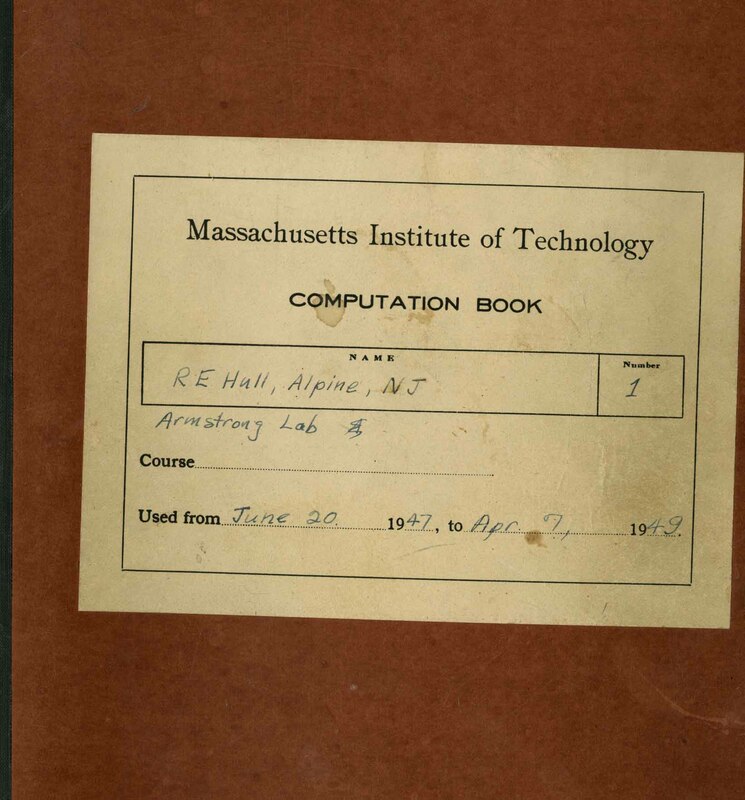 This was made possible on his own dime, of course. 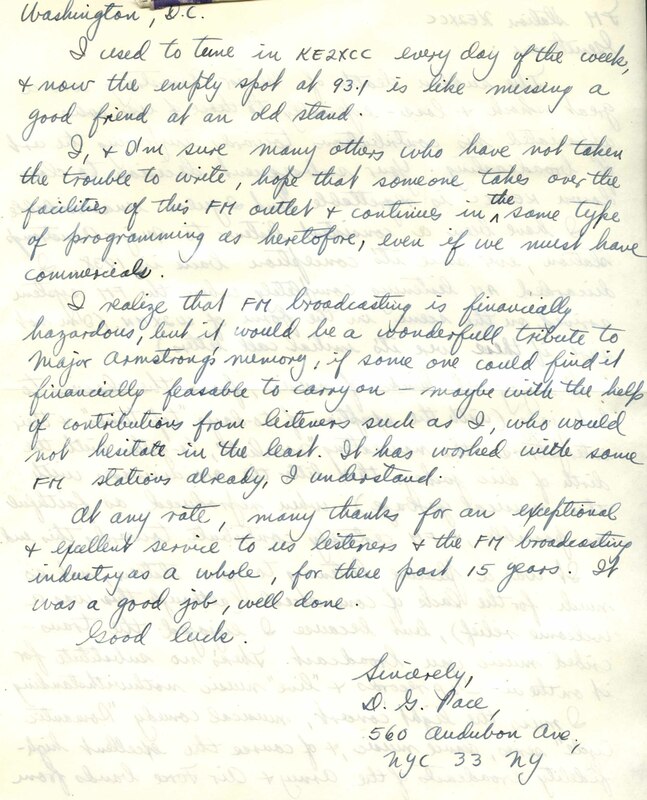 I think the letters speak for themselves…. 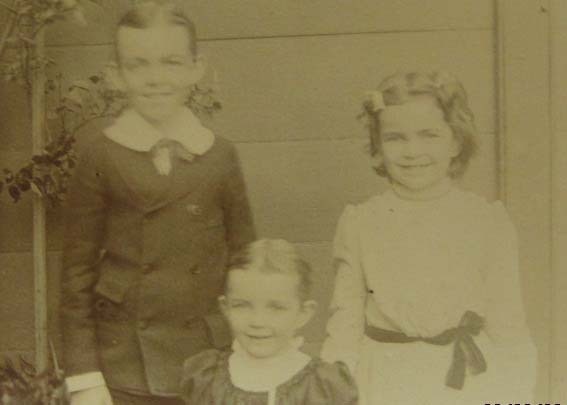 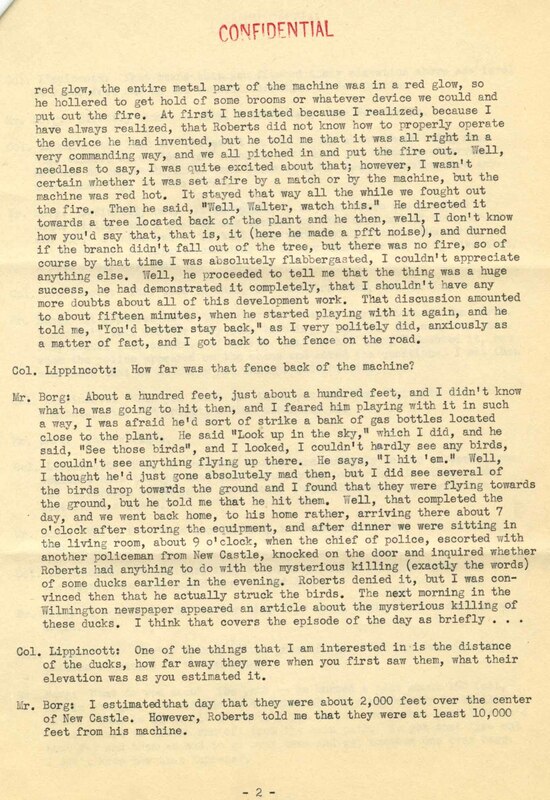 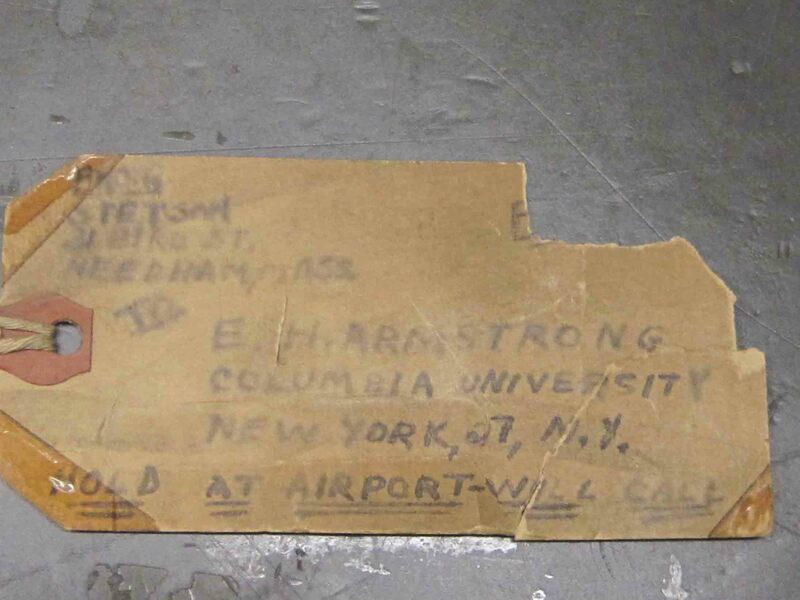 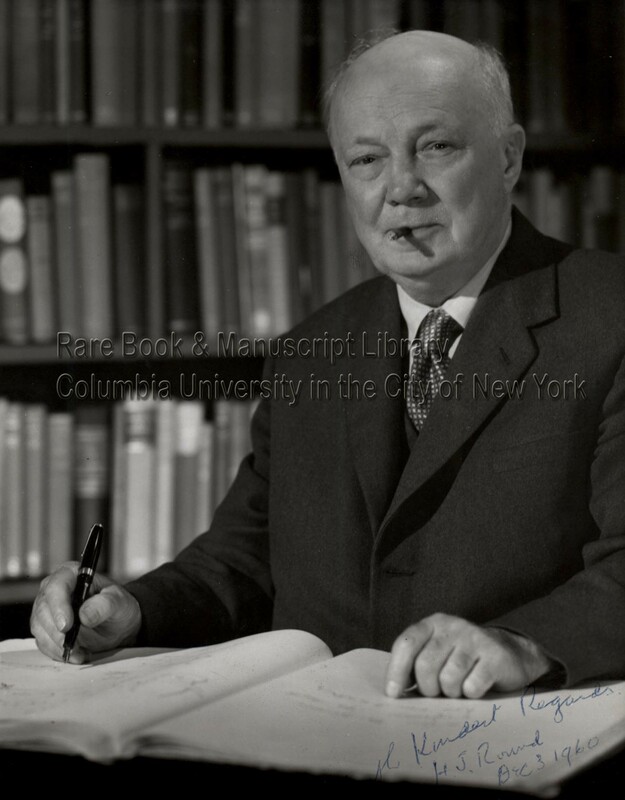 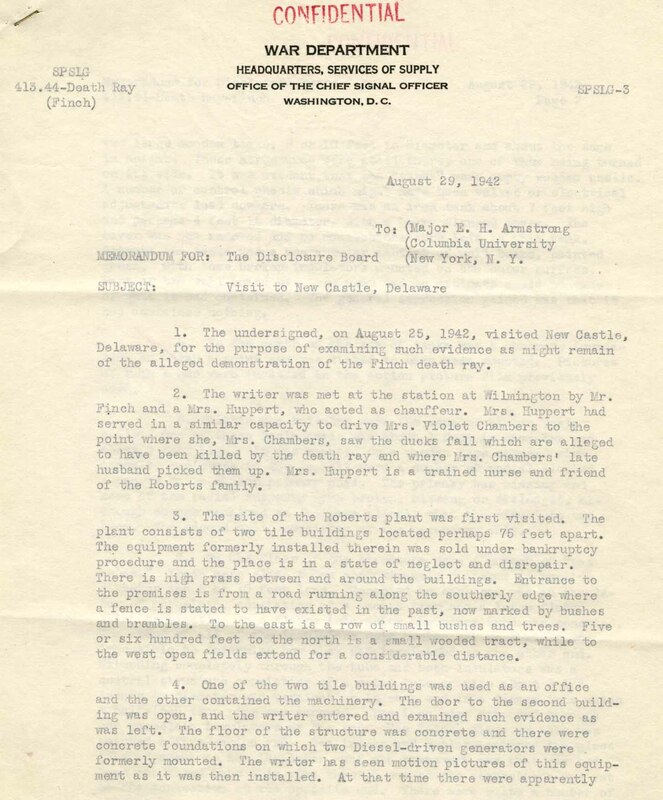 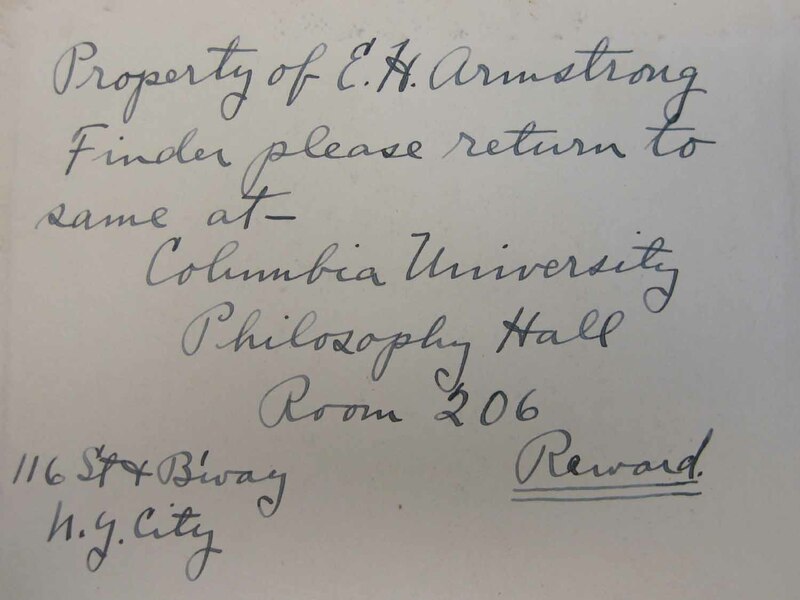 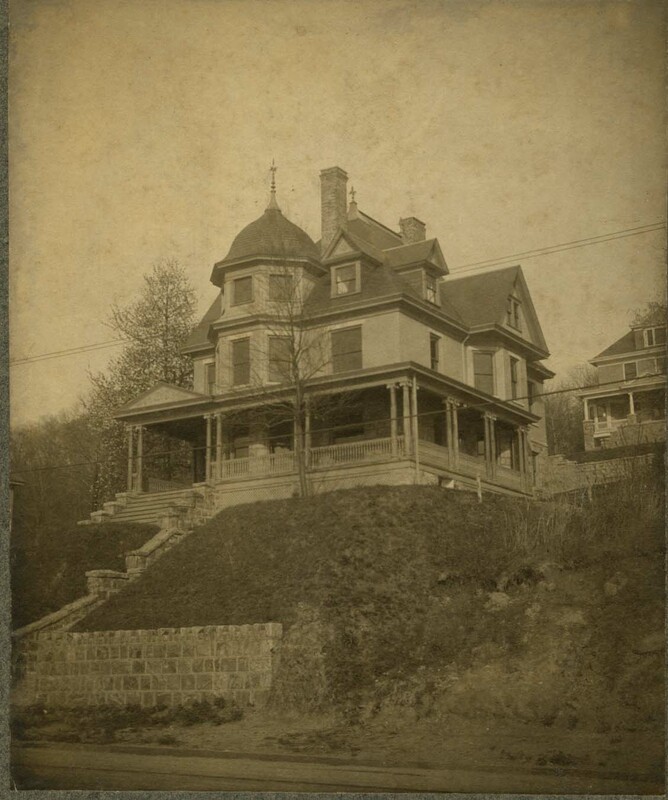 Note for documents seen above: Al McCormack was Armstrong’s longtime attorney and friend. 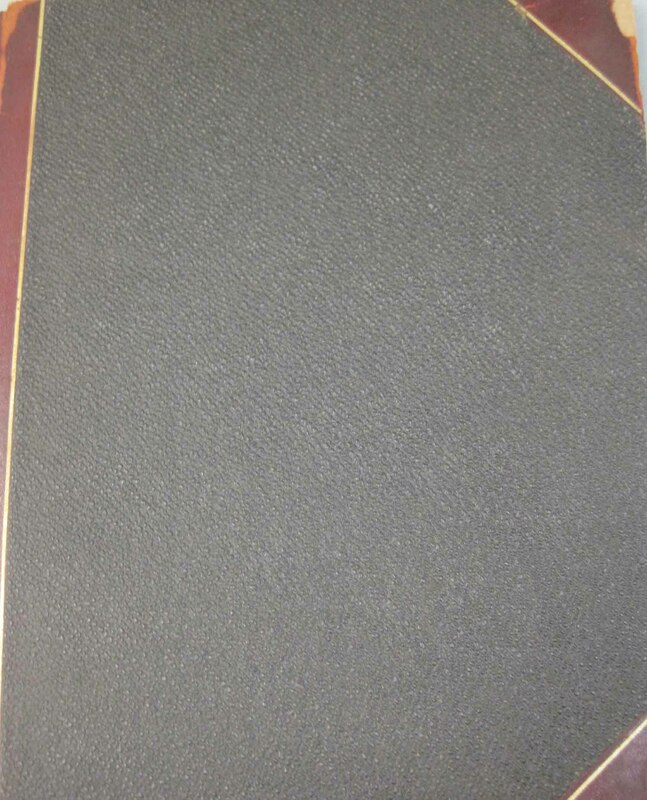 This entry was posted in Popular and tagged Al McCormack, Alpine, KE2XCC, W2XMN on August 25, 2010 by Jennifer Comins.